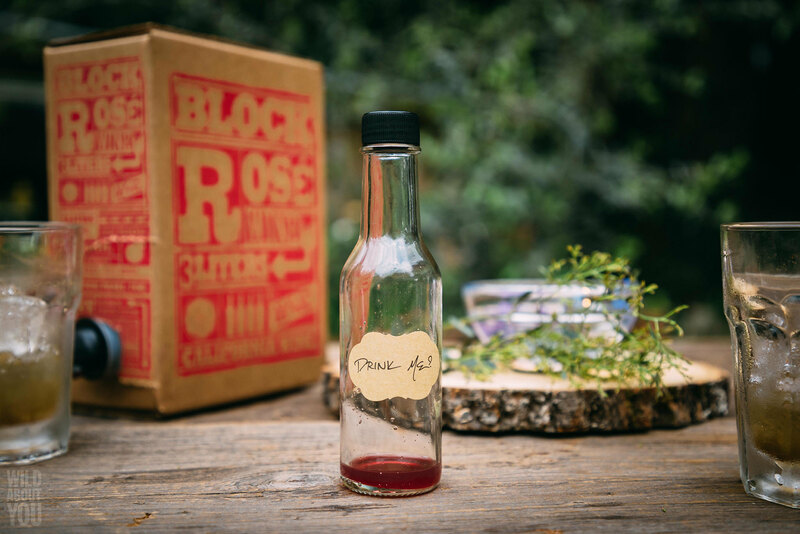 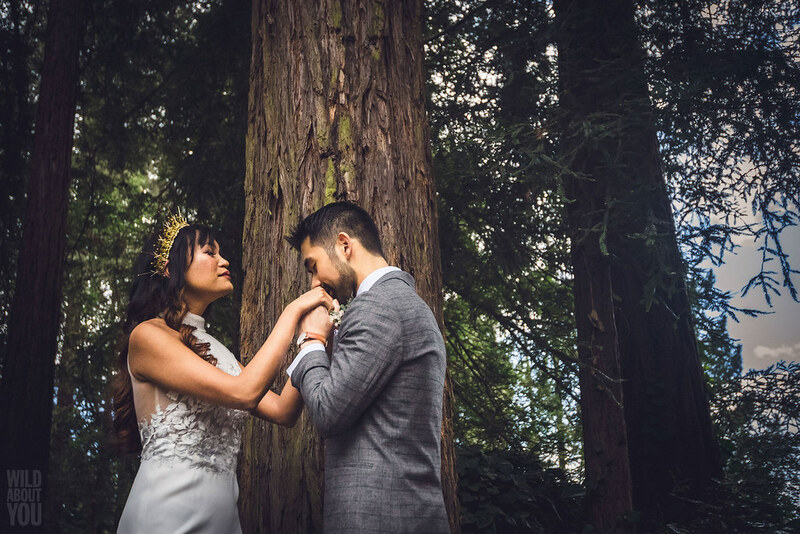 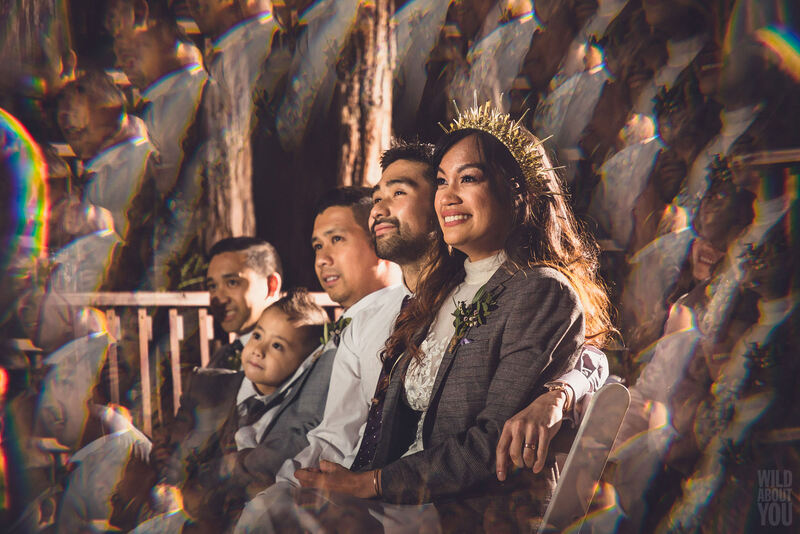 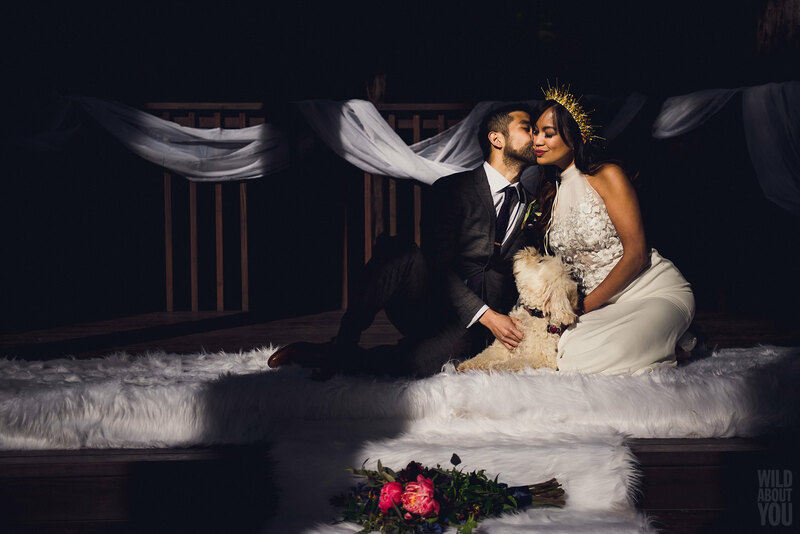 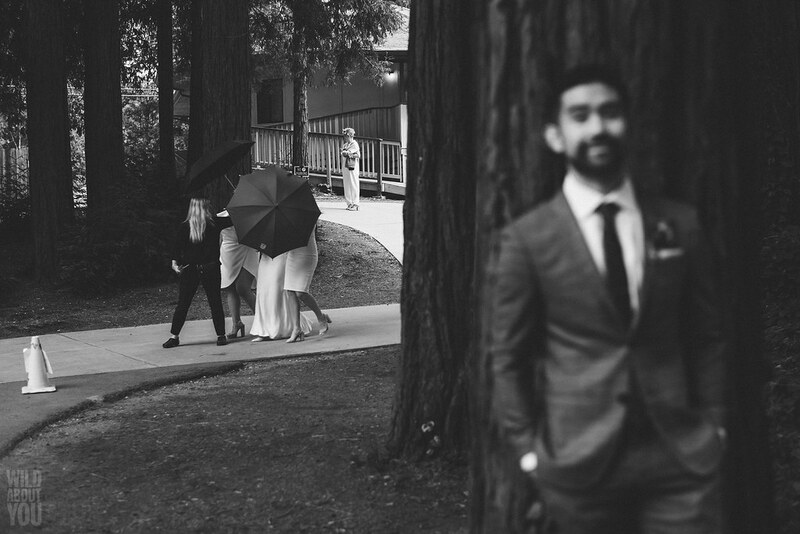 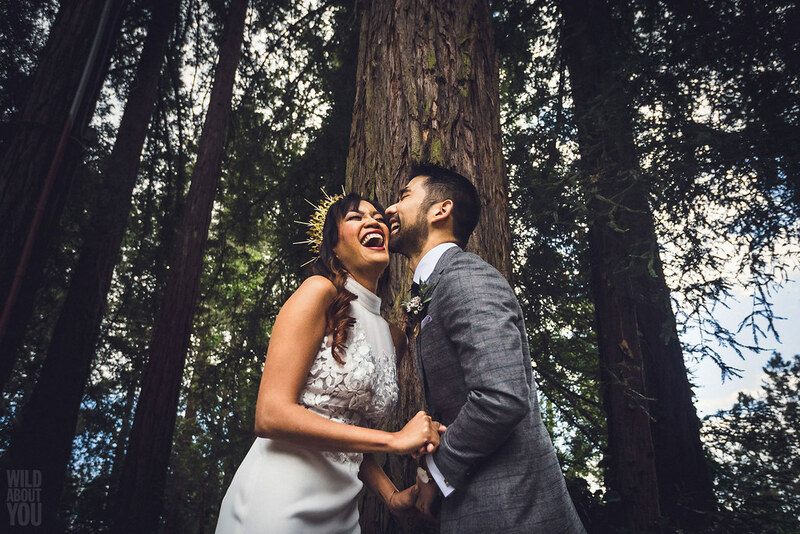 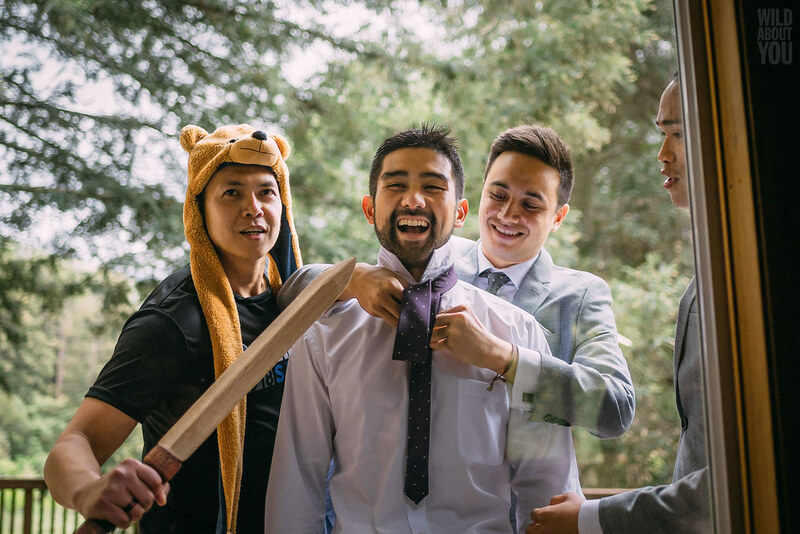 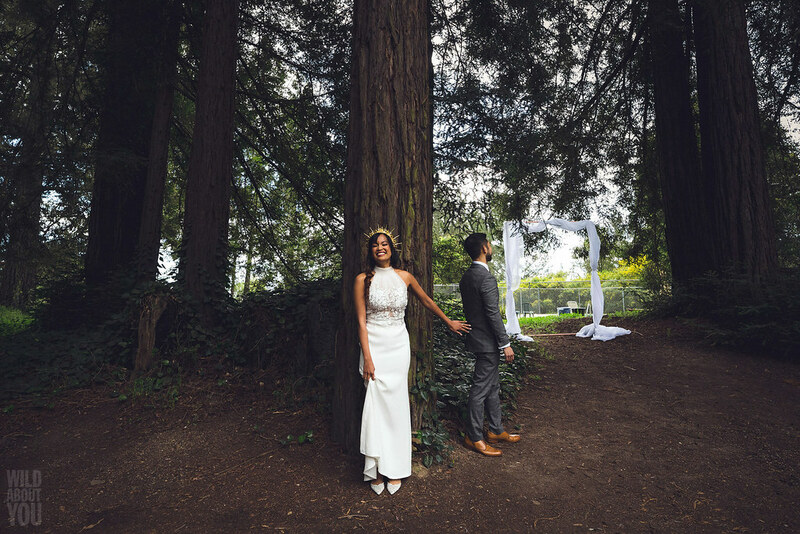 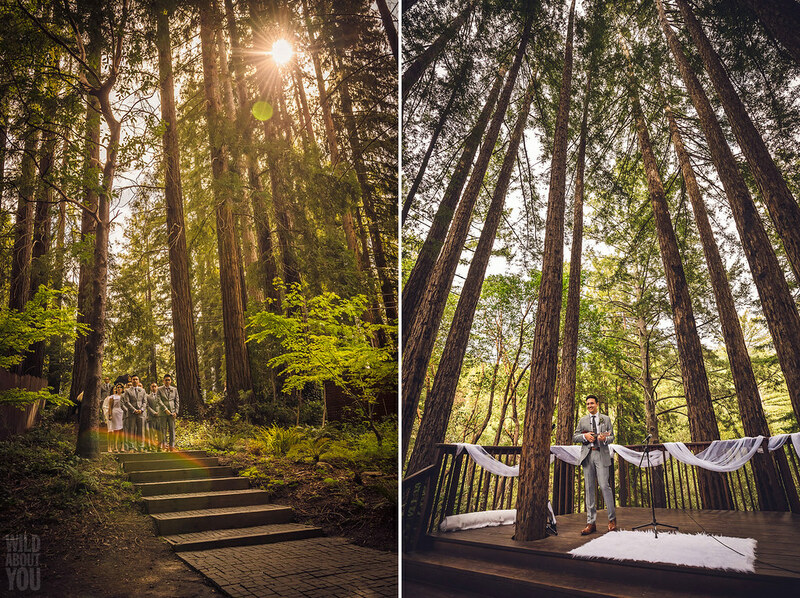 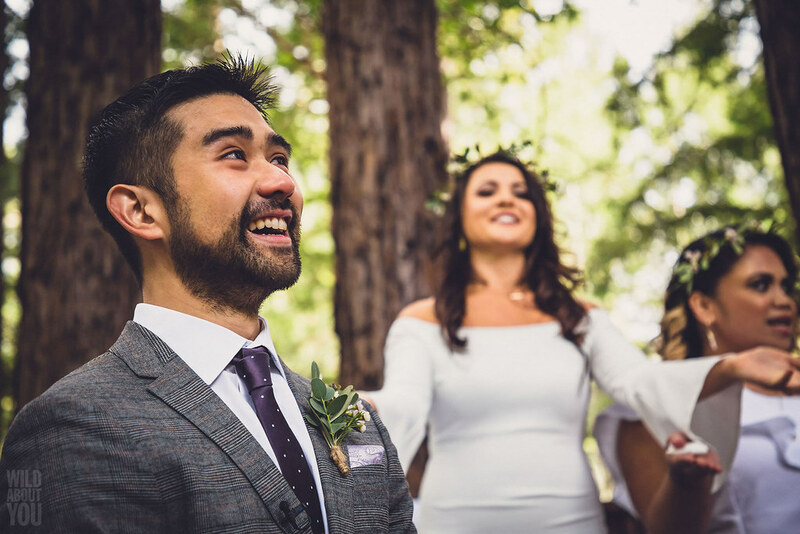 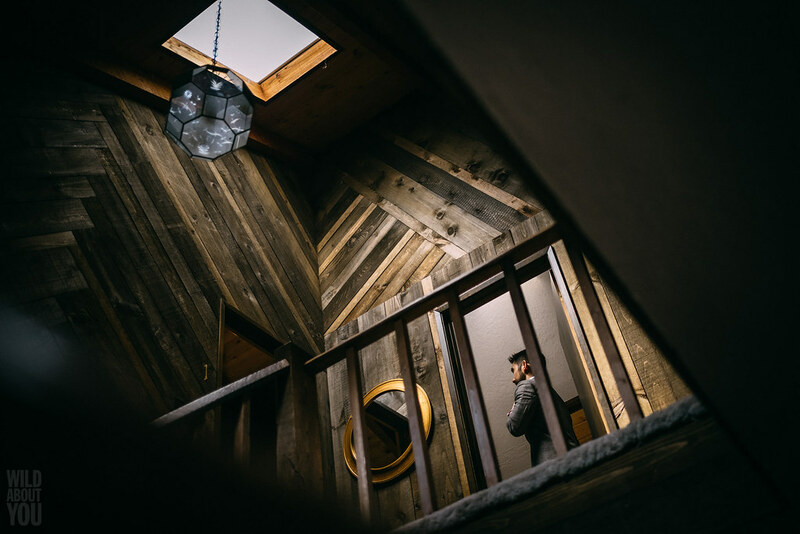 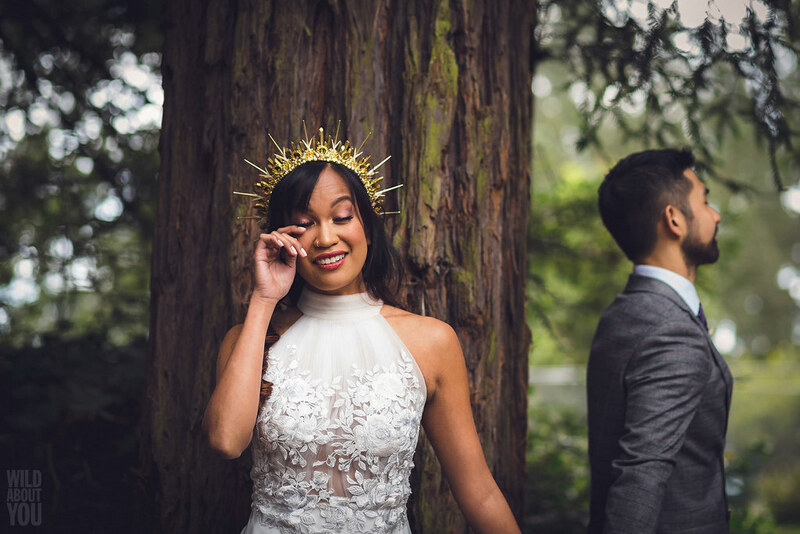 Justine and Josh were living on opposite coasts (she in NYC, he in Oakland) when they hired us to capture their wedding at Pema Osel Ling, a sprawling retreat tucked in the redwood forests of the Santa Cruz Mountains. 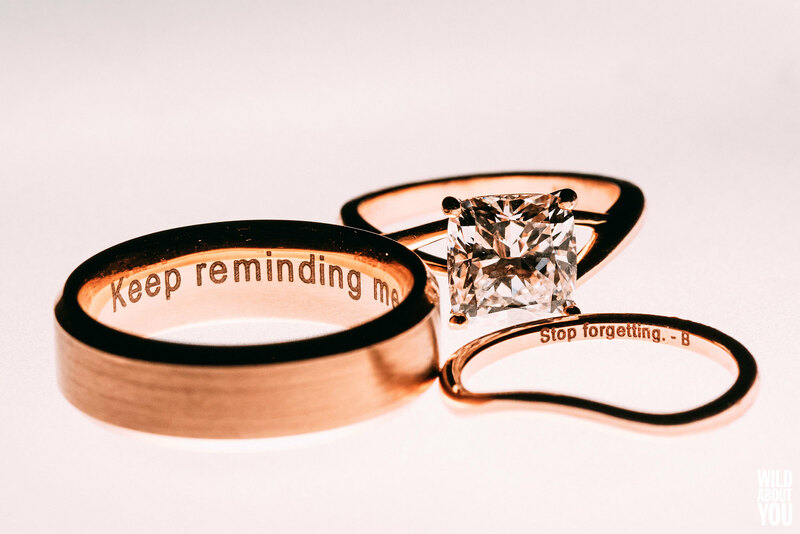 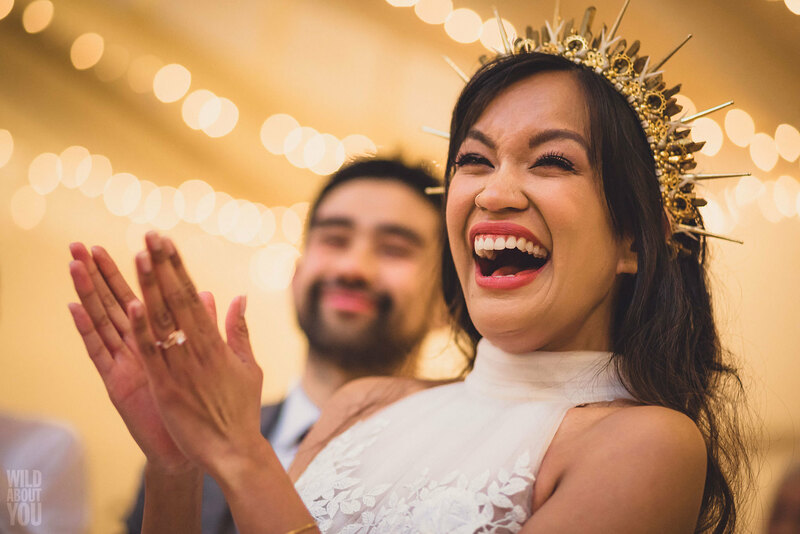 Their enthusiasm for their wedding was infectious and, after watching the charming stop-action save-the-date video they’d made, we knew we were in for a fun-filled, one-of-a-kind (re)treat. 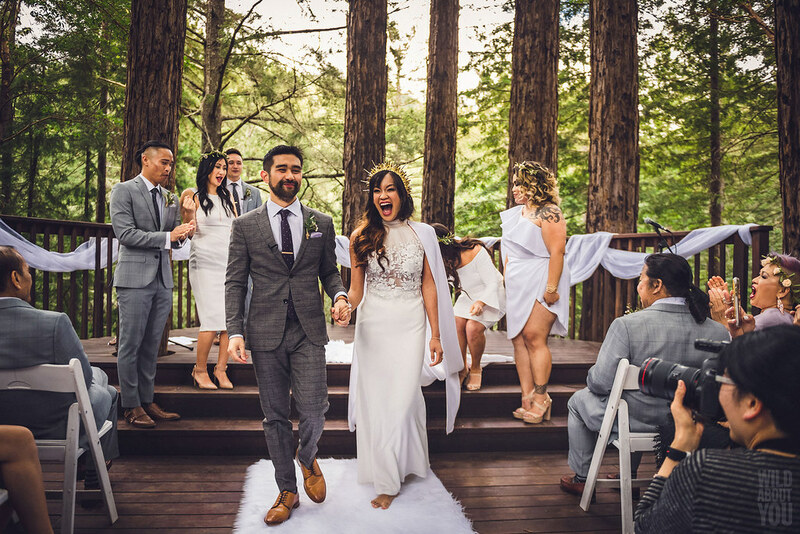 “POL is one of the rare places that could house all of our friends and family exclusively in one place, felt detached from the real world, and had campsites and cabins for the adventurous spirit in us!” says Justine. 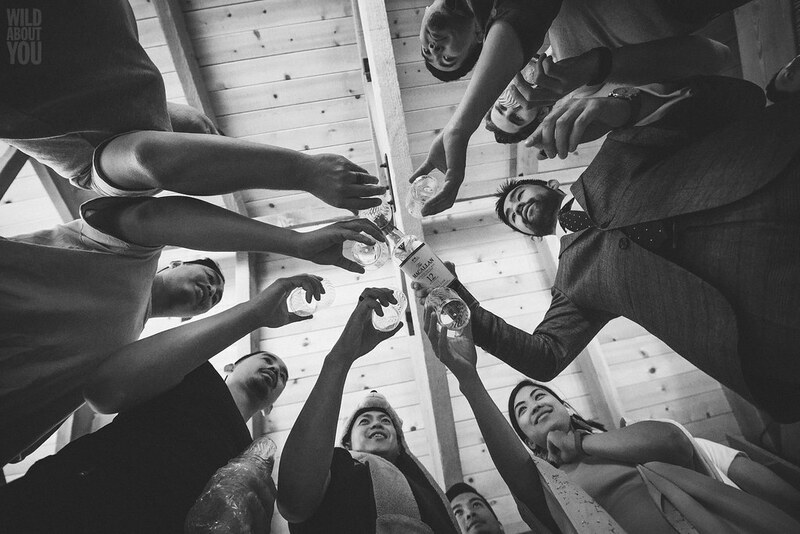 A welcome party on Friday kicked off the festivities. 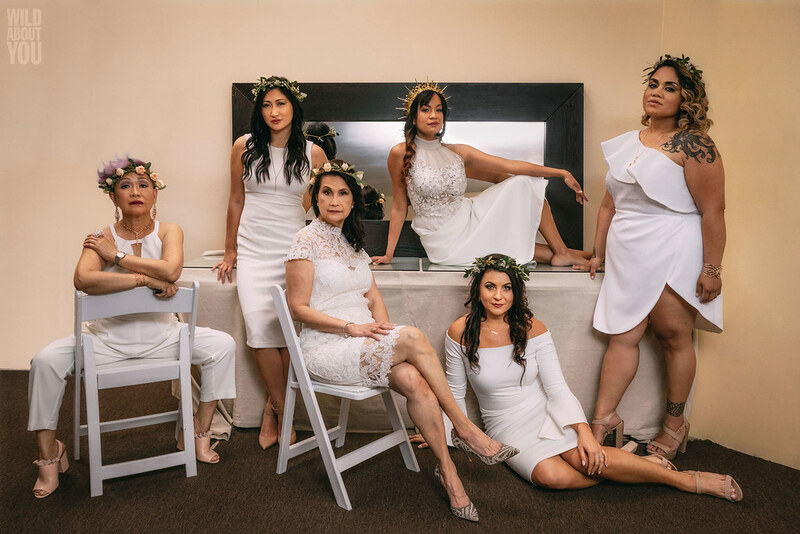 One of the highlights was “Hot Seat” with their parents, where all of the guests could ask them any questions they wanted. 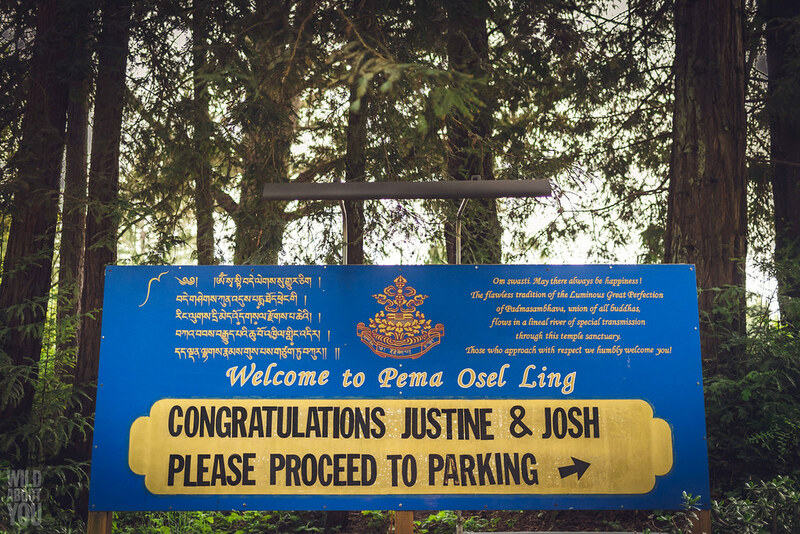 “Josh’s dad told the story of his first ‘kiss’ with Josh’s mom, which involved sneaking into a hospital bathroom with the lights off and accidentally setting off the emergency alarm,” recalls Justine. 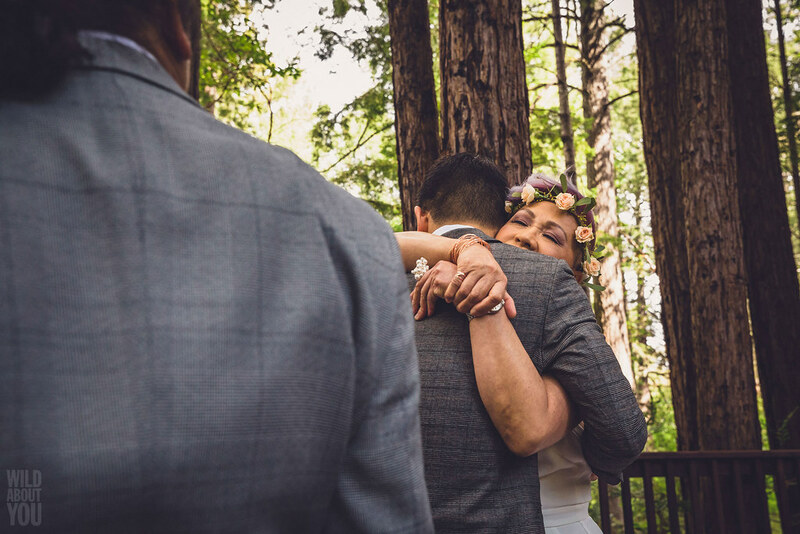 On their wedding day, our couple got ready separately but made sure to have a moment together before they walked down the aisle. 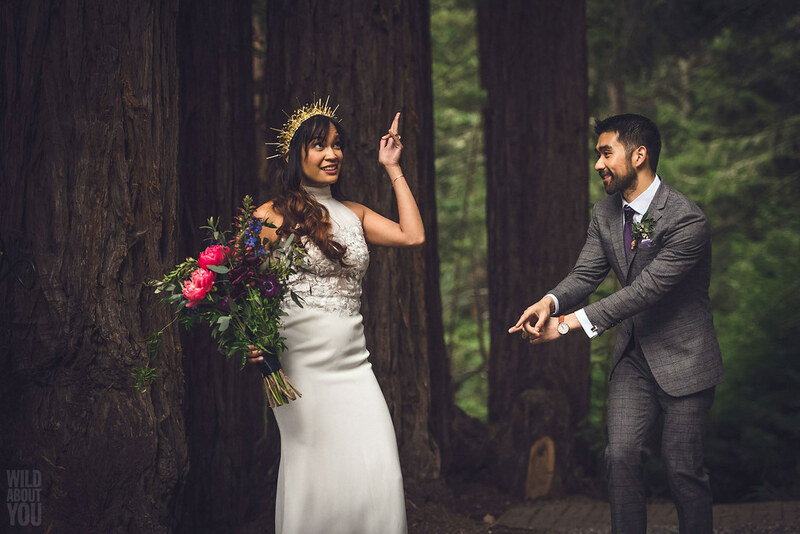 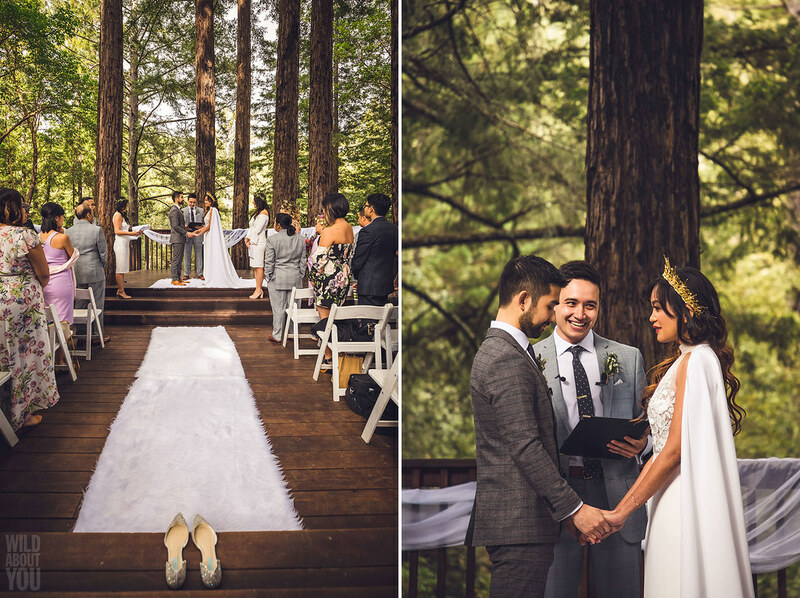 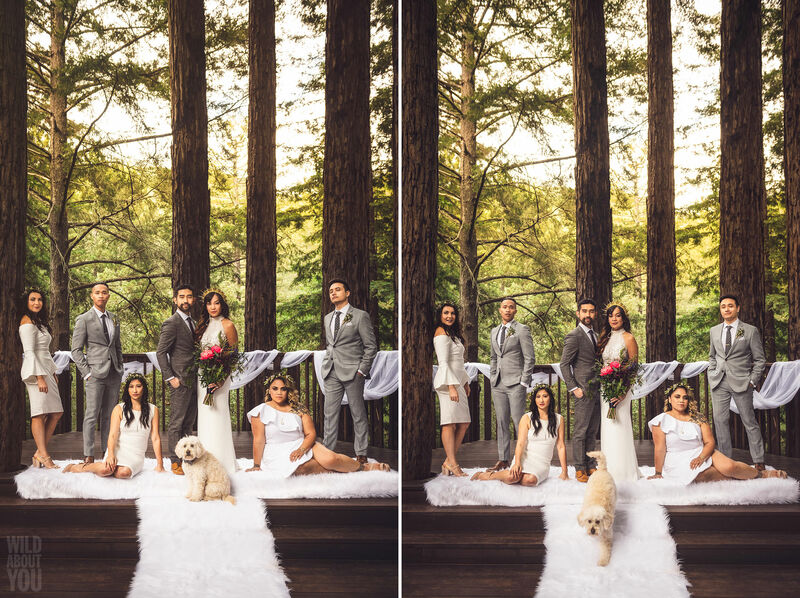 Rather than a first look, they shared a first touch by a redwood tree. 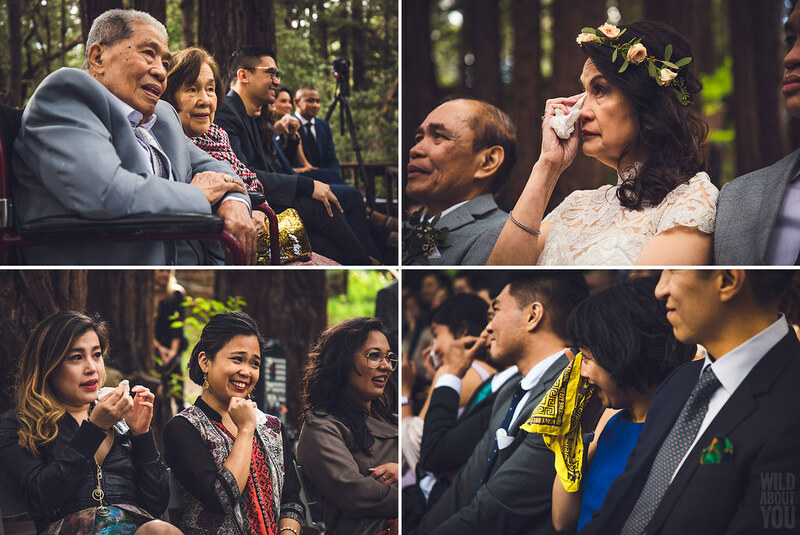 With their eyes squeezed shut, they didn’t know that their wedding party (really their “Best People”) and moms were watching (and crying!) 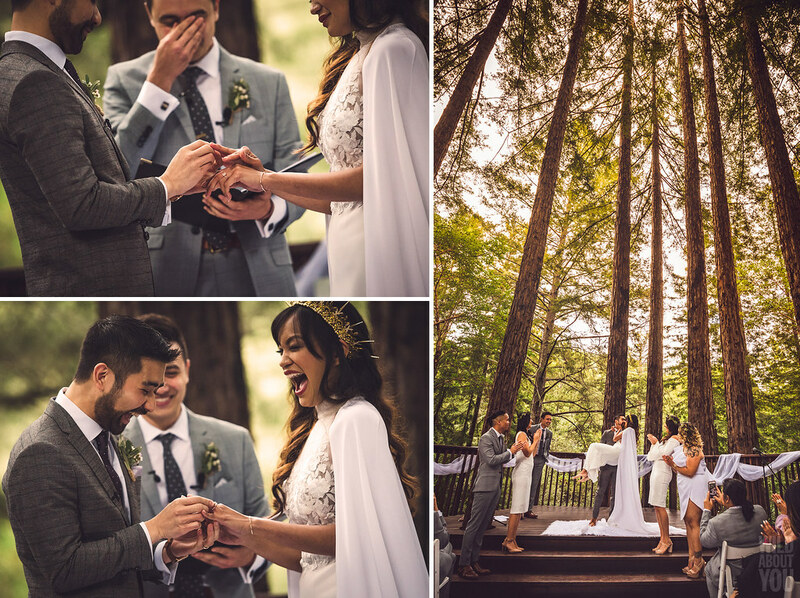 as they fumbled for each other’s hands and faces, wiped away tears, and expressed their excitement. 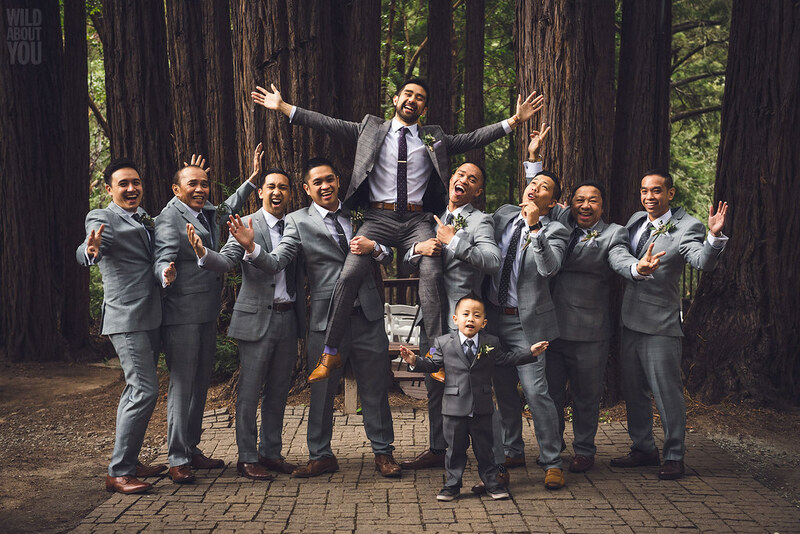 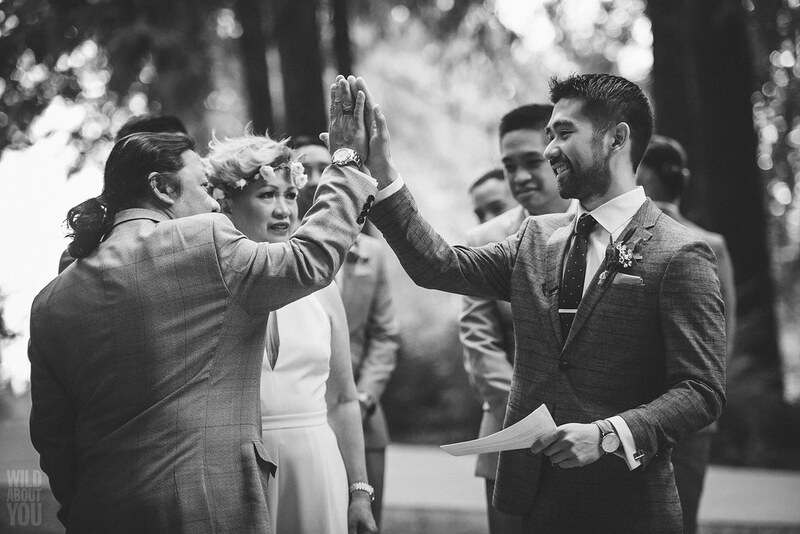 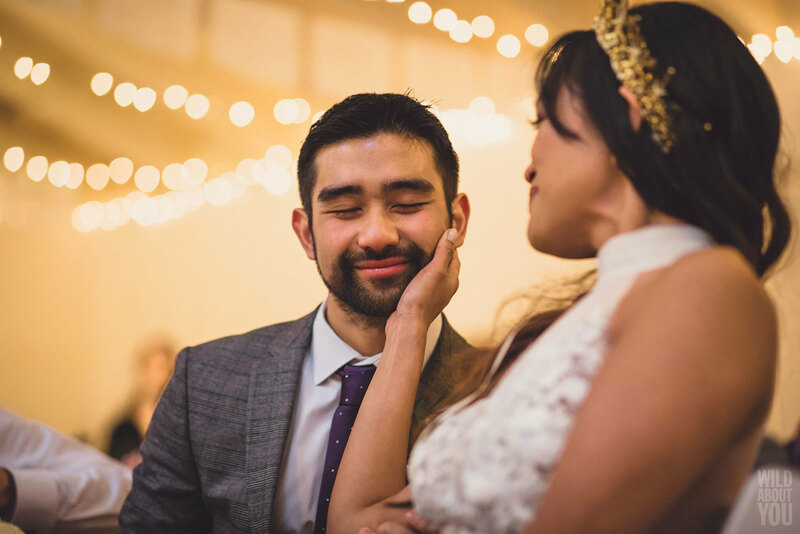 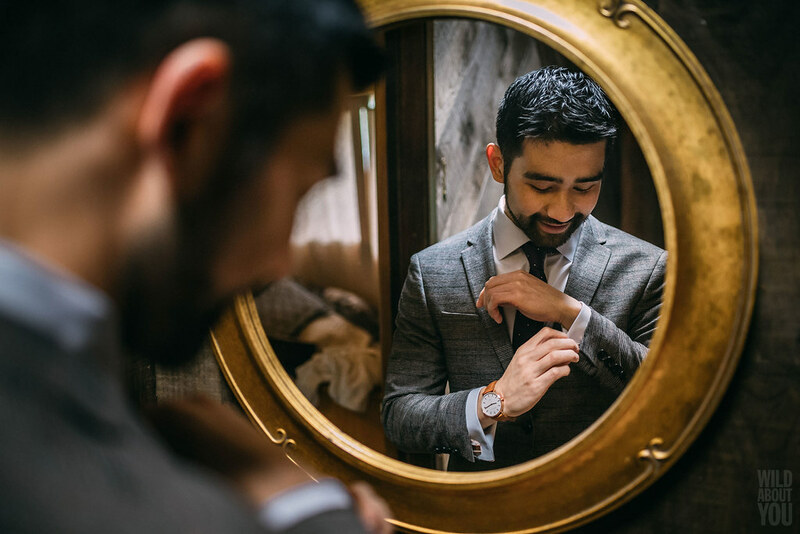 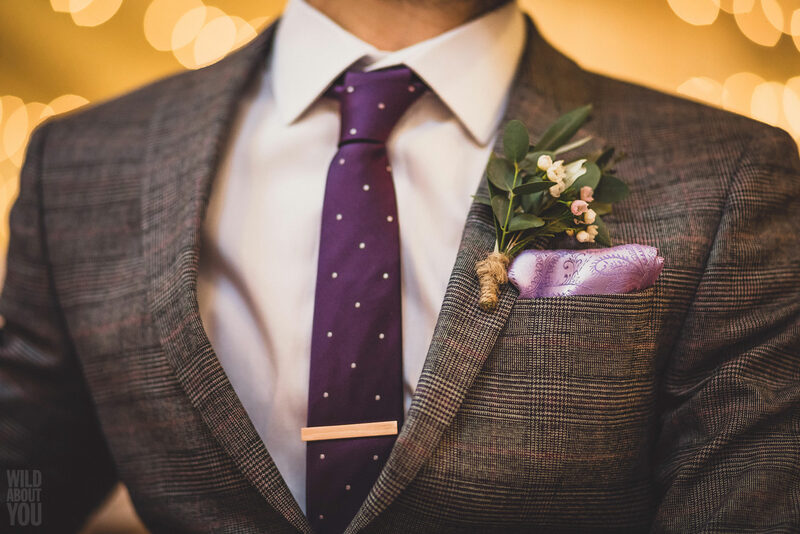 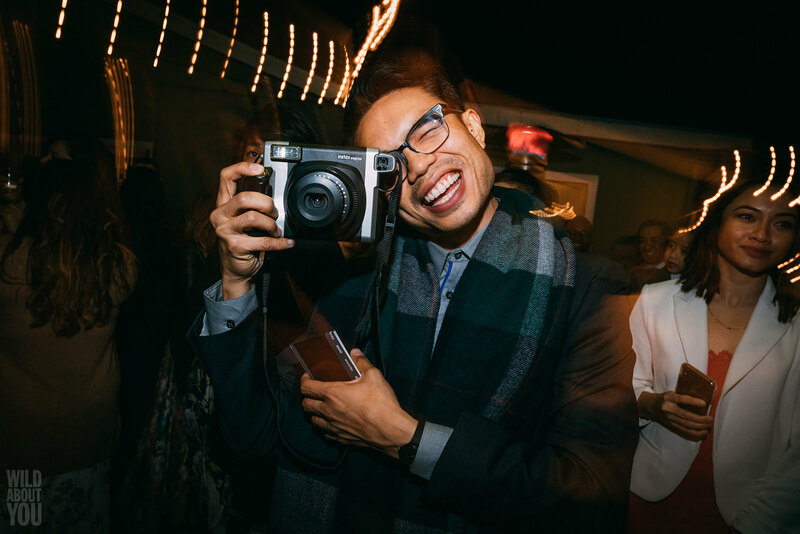 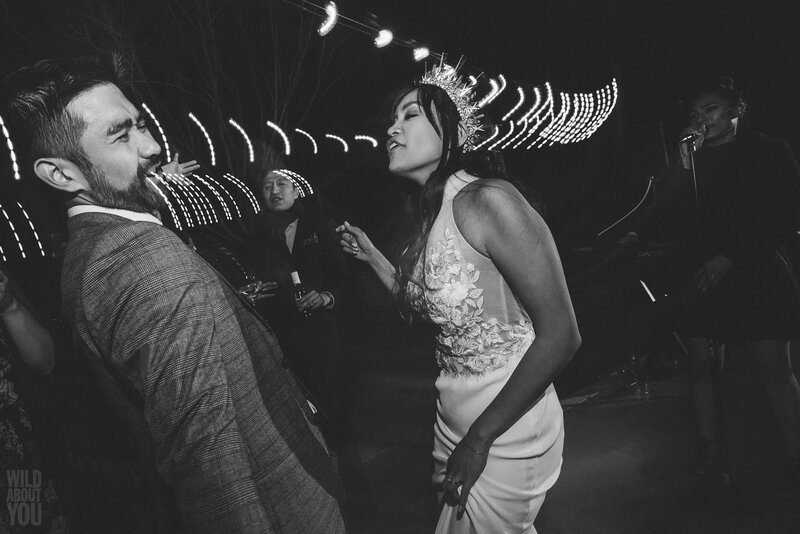 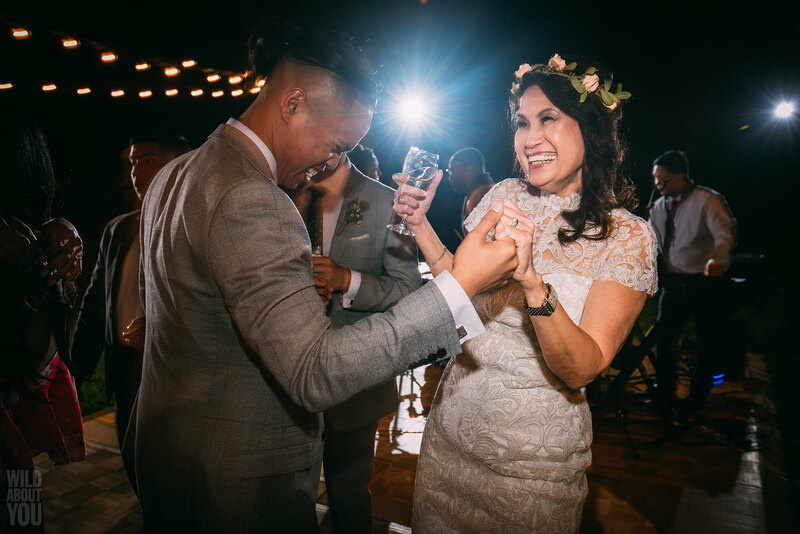 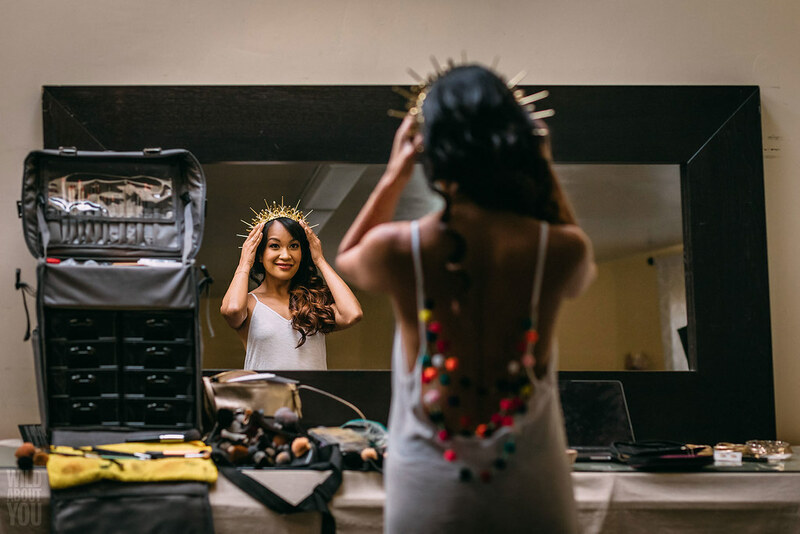 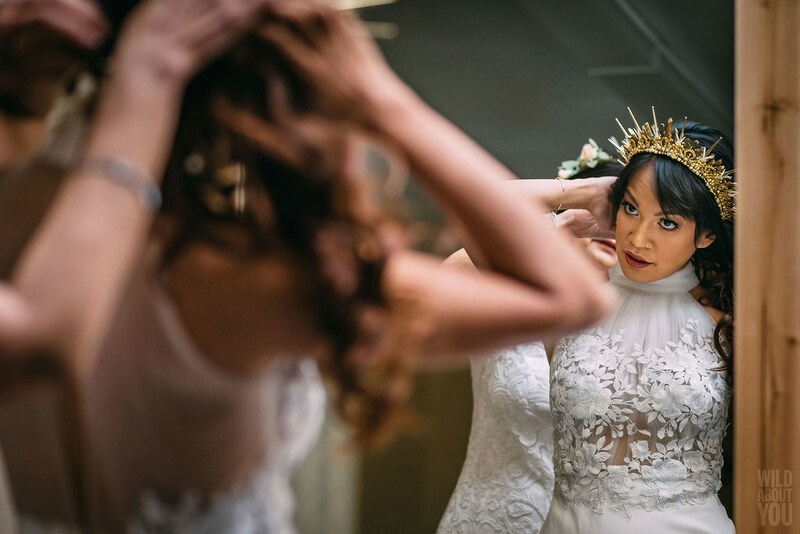 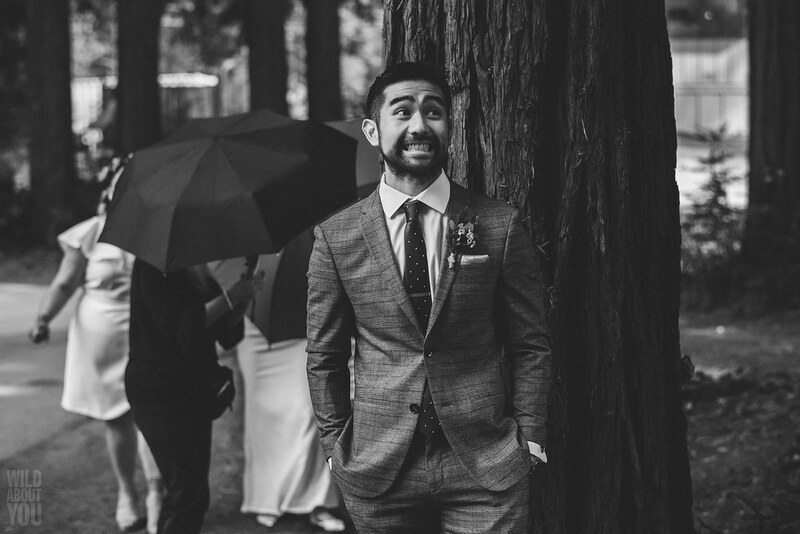 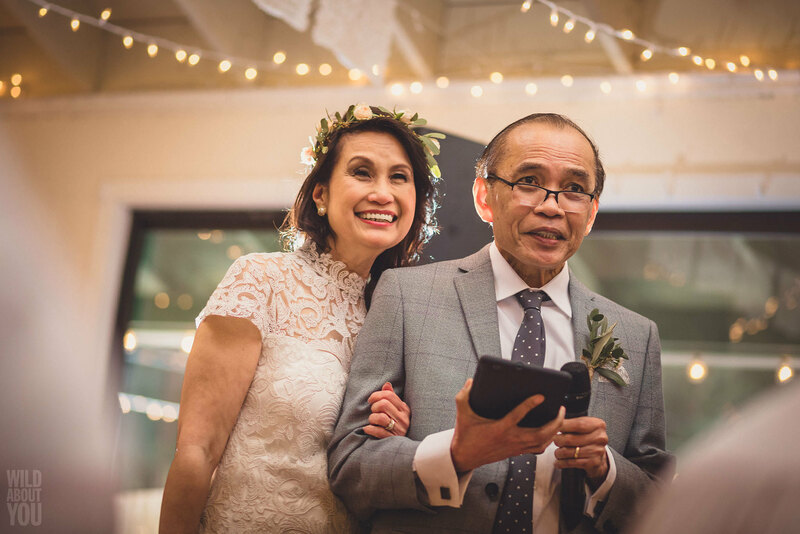 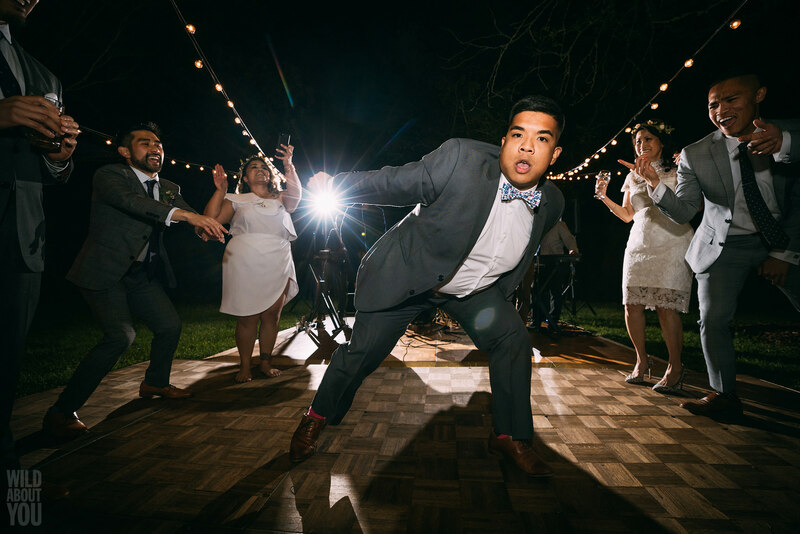 Justine turned heads in her elegant white gown and an awesome, custom Pilipino-inspired crown, while Josh rocked a sharp gray suit complemented by a purple polka-dot tie and lavender paisley pocket square. 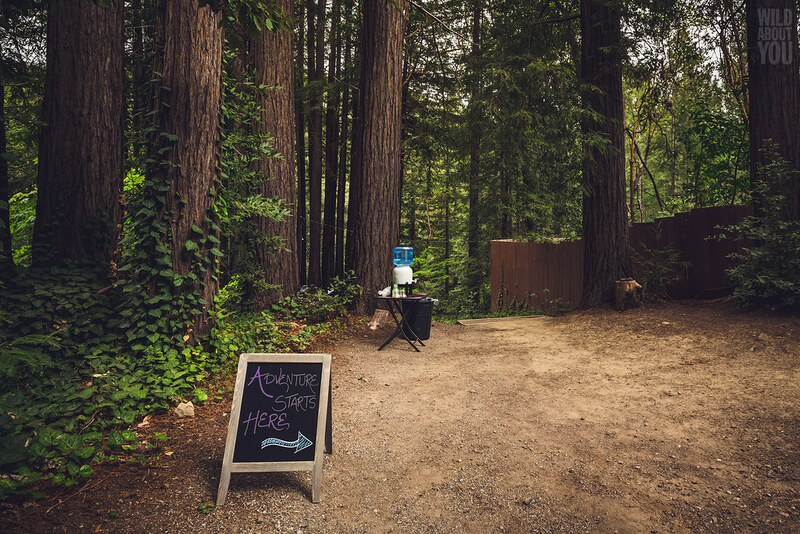 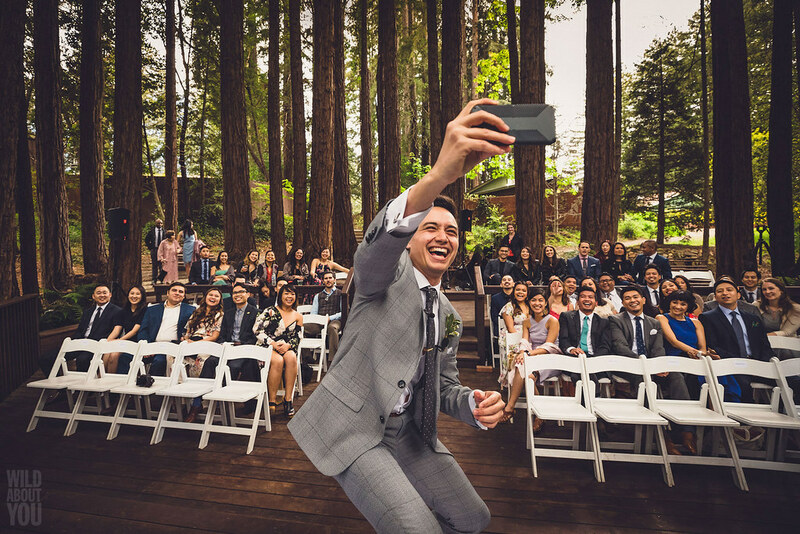 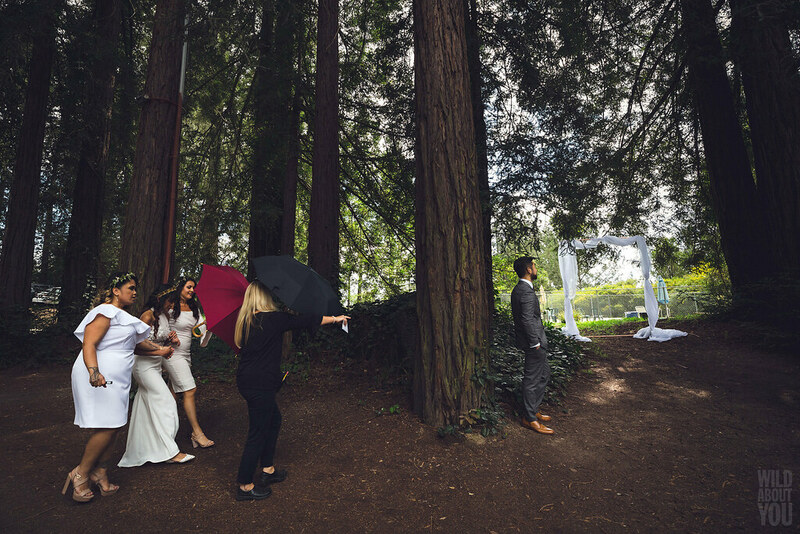 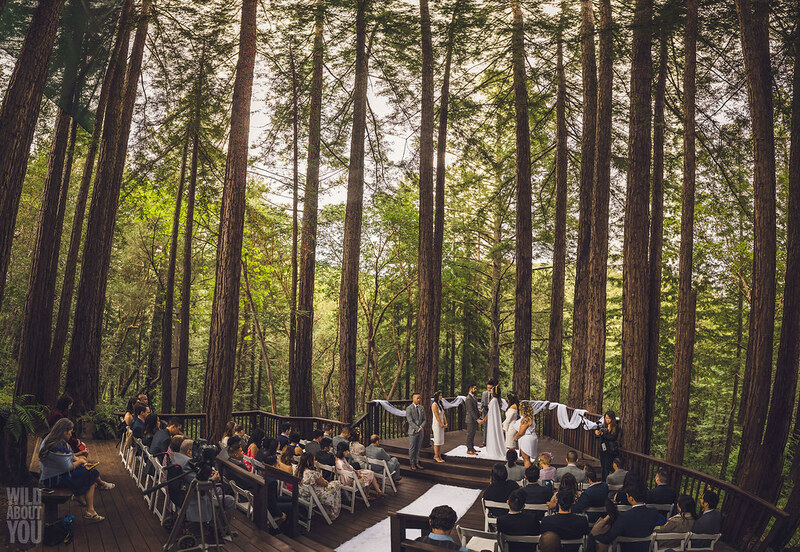 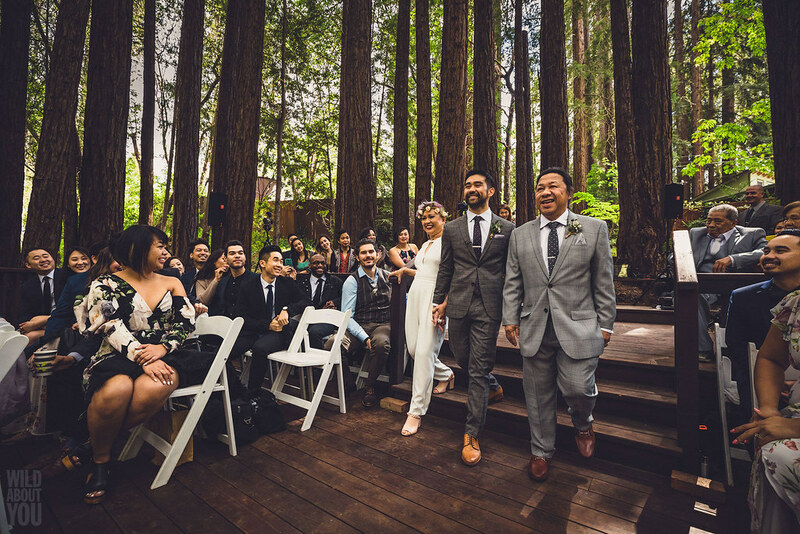 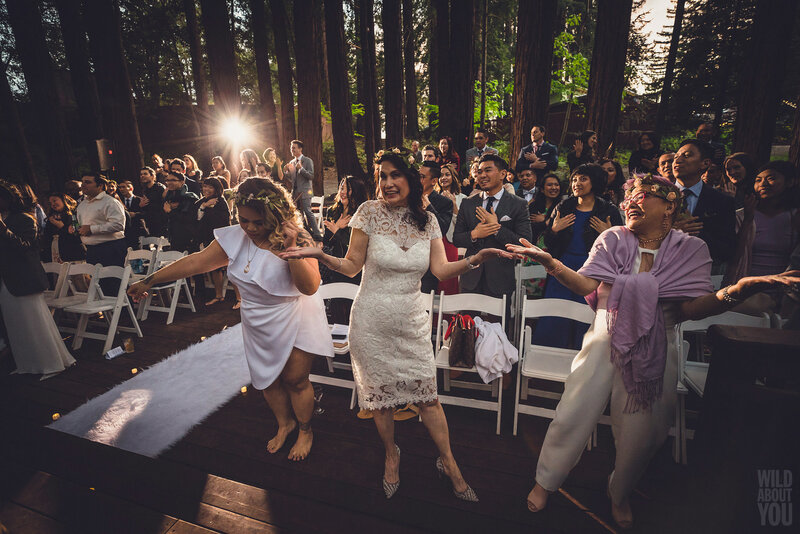 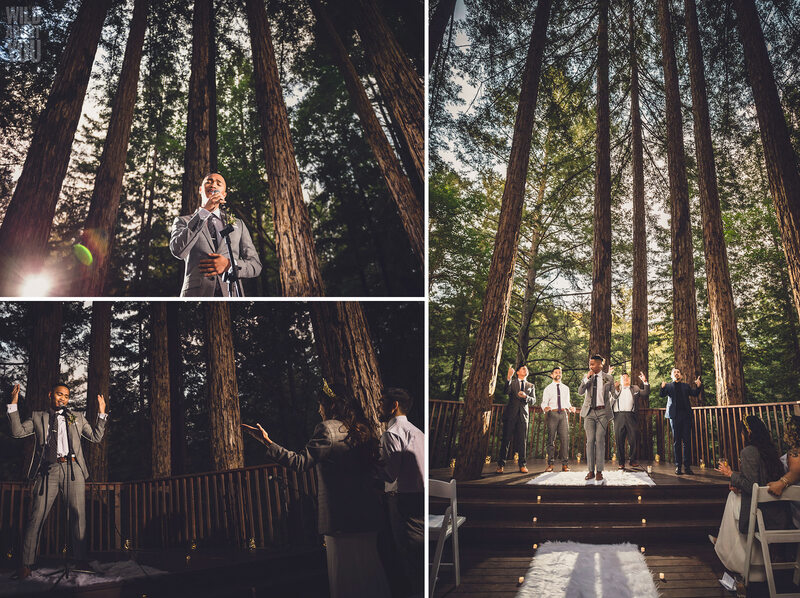 Soon it was time to join their guests in the Amphitheatre of the Redwoods, the spot that hooked Justine and Josh immediately. 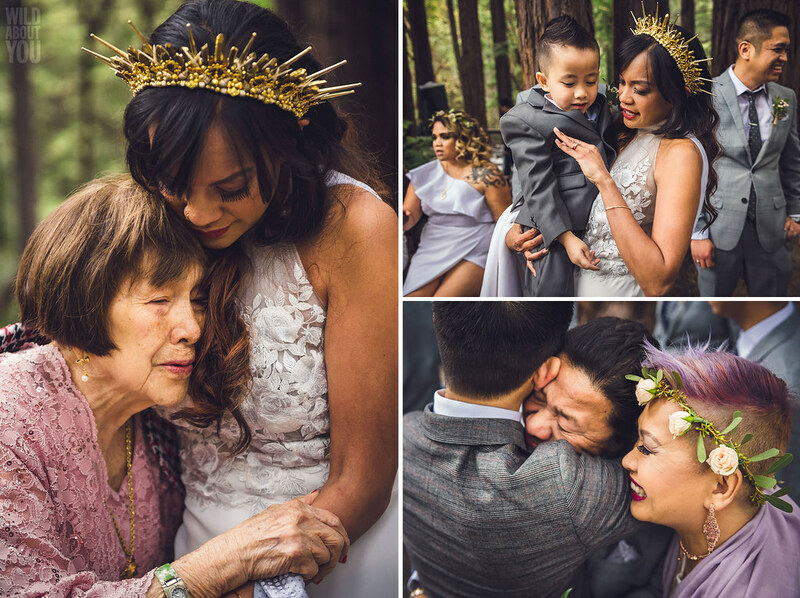 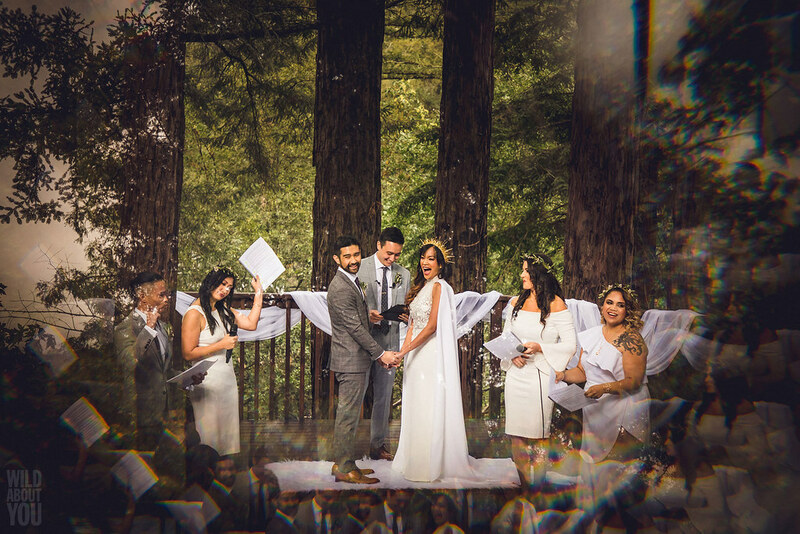 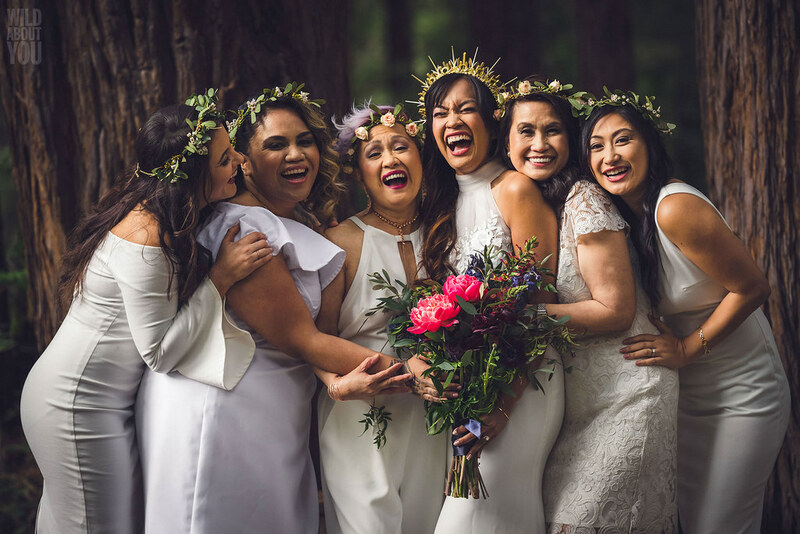 “When we walked into the fairy ring of towering redwoods where the ceremony would be, we both could imagine all of our loved ones wrapped with its solemn, quiet serenity. 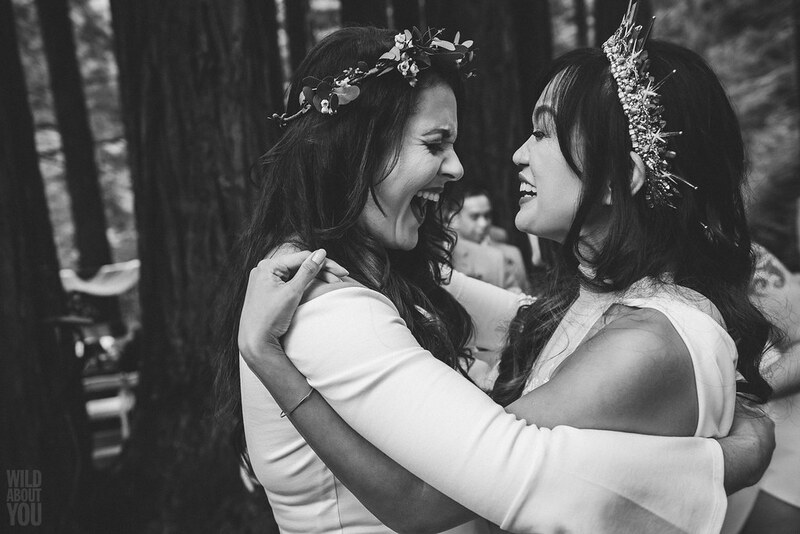 It was a magical, emotional, and peaceful place—it was perfect,” says Justine. 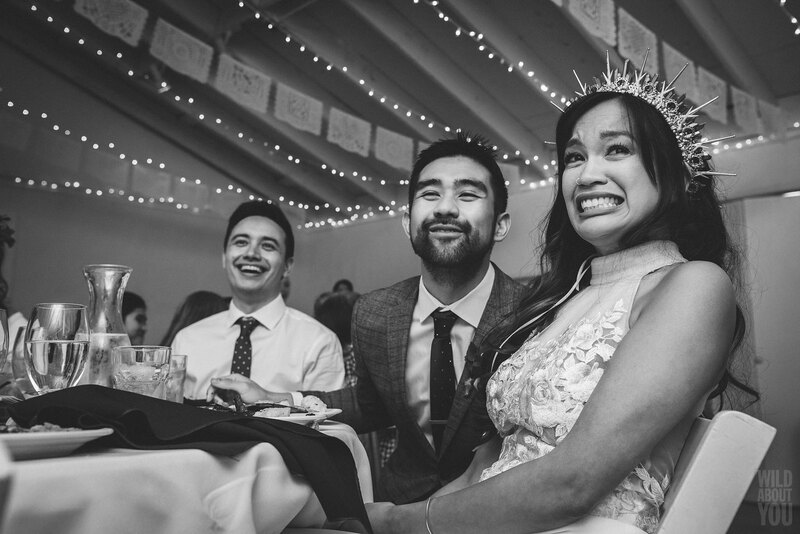 And it was absolutely that. 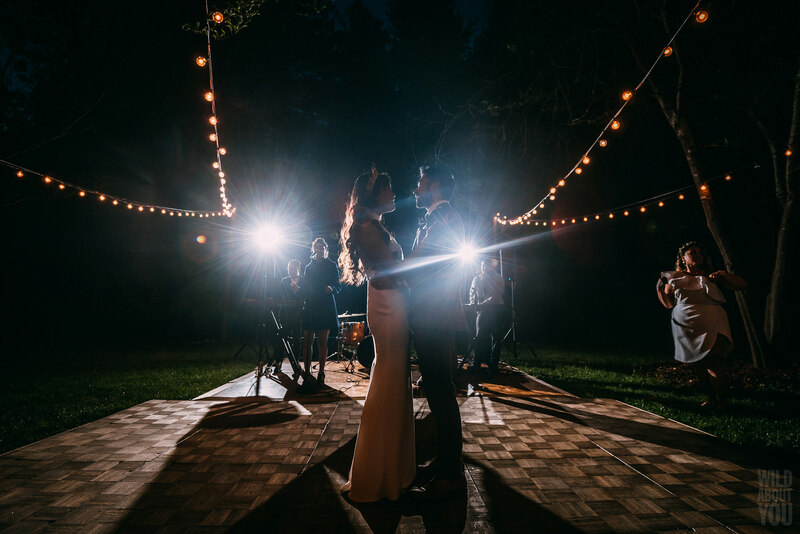 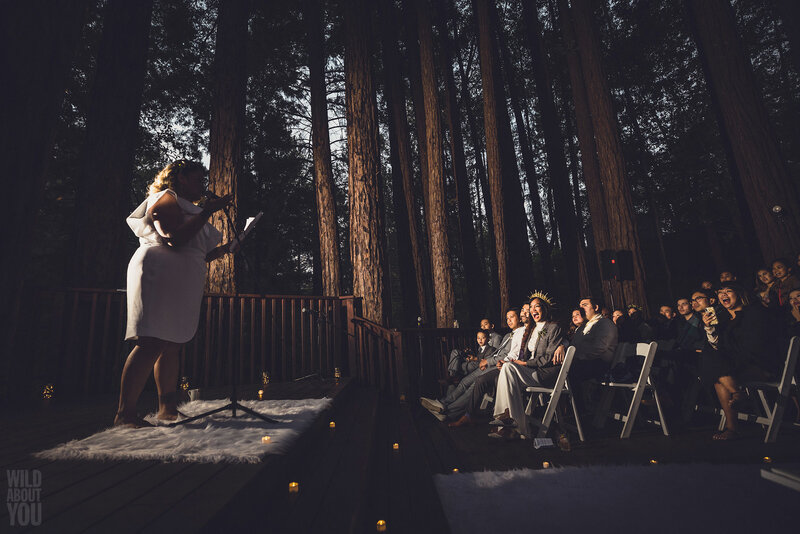 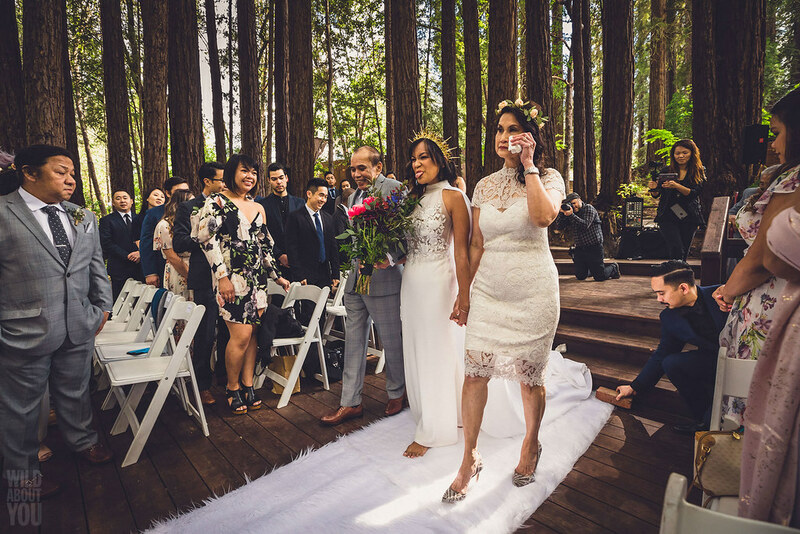 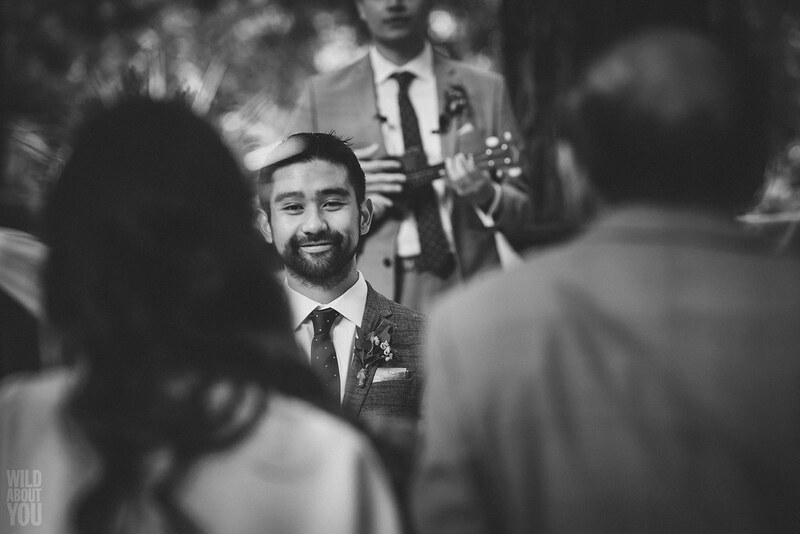 One of Josh’s favorite moments was hearing officiant Alex’s ukulele rendition of “Stand by Me” echoing through the forest as well as Justine strolled barefoot down the white fur carpet in her flowing white cape, gown, and gleaming crown. 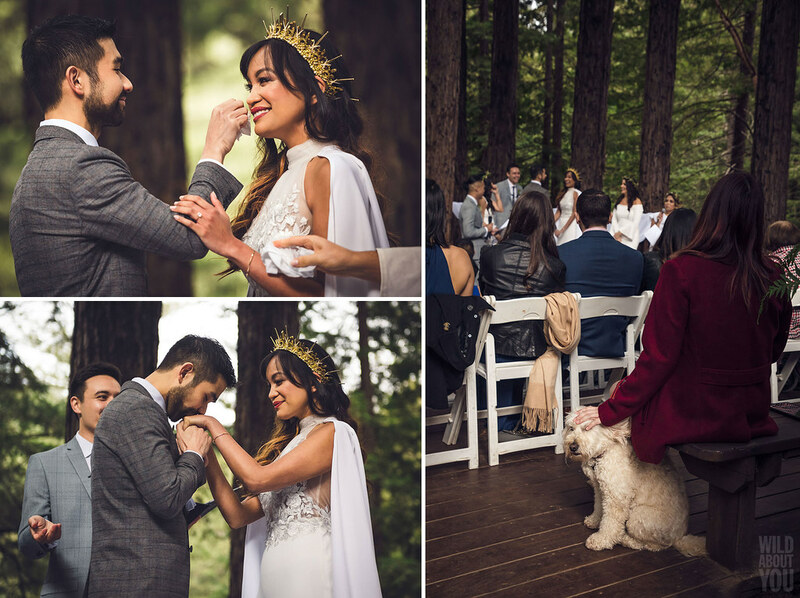 They had opted for an unplugged wedding, which was a great decision. 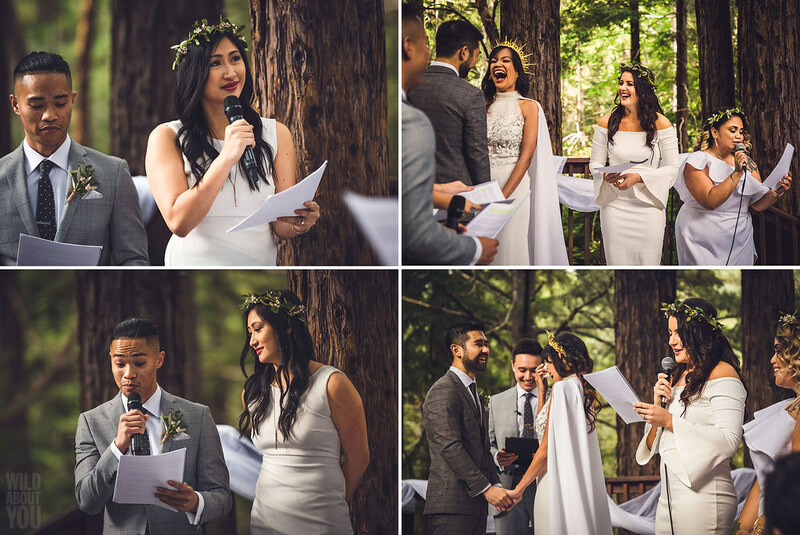 Each and every guest was fully present for Alex’s surprise ceremony, which included snippets of recorded interviews Alex did with the couple that the wedding party read aloud, much to everyone’s amusement. 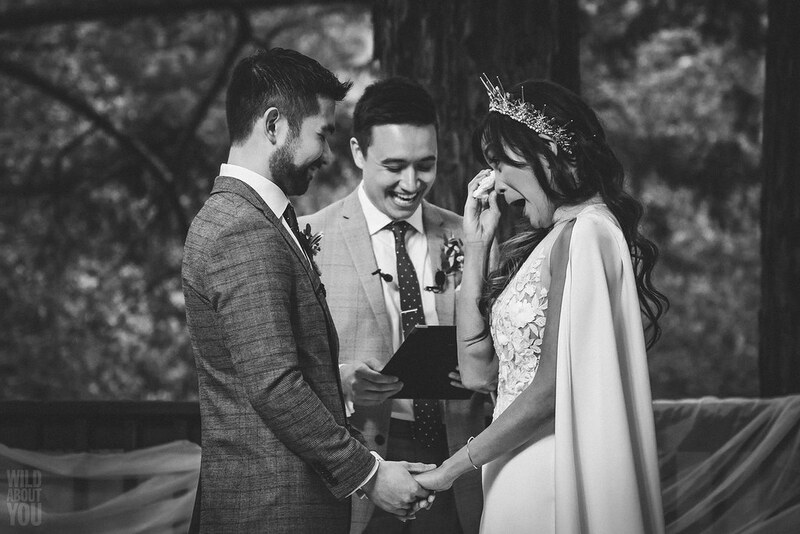 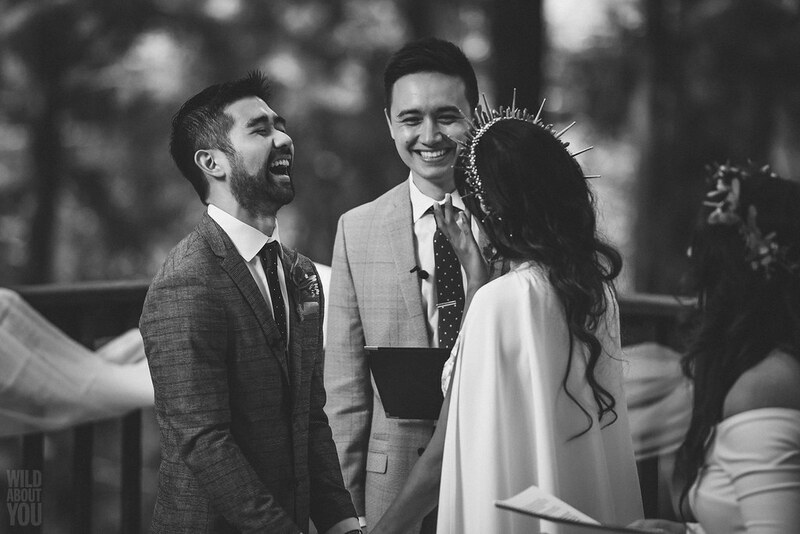 Laughter abounded, as did copious tears, especially when Justine and Josh read their heartfelt vows. 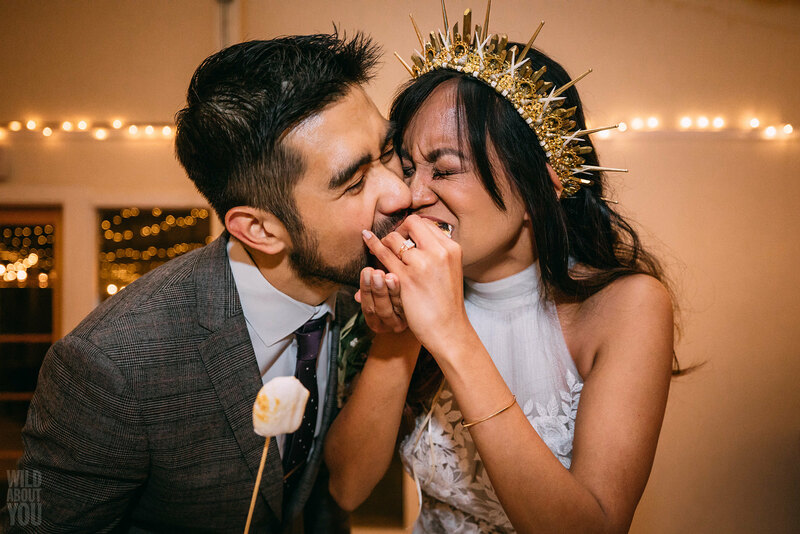 Emotional rollercoasters can be exhausting but Josh somehow still had energy to whisk Justine up in his arms for their first kiss! 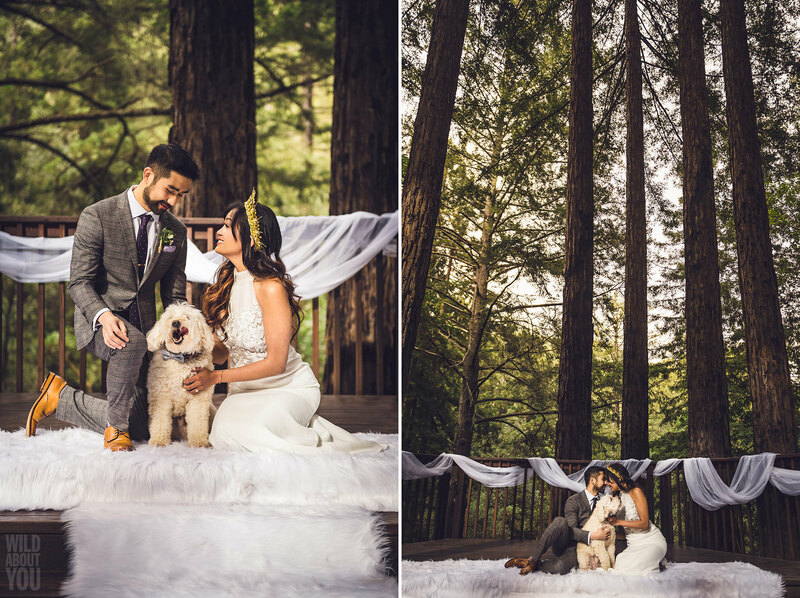 Their adorable dog Oatmeal, who had been patiently waiting in the back, was a blur of curly cream fur, wagging tail, and sloppy kisses as he reunited with his parents. 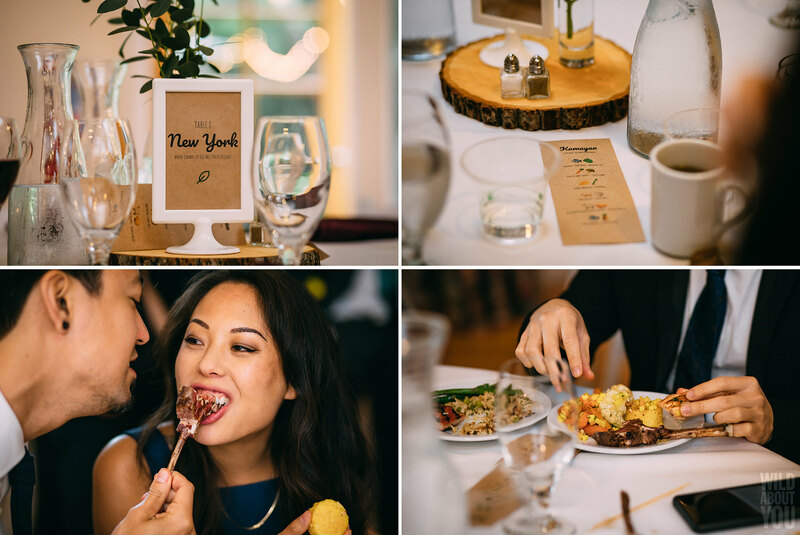 The reception offered more laughter and tears, as well as a delicious utensil-free dinner. 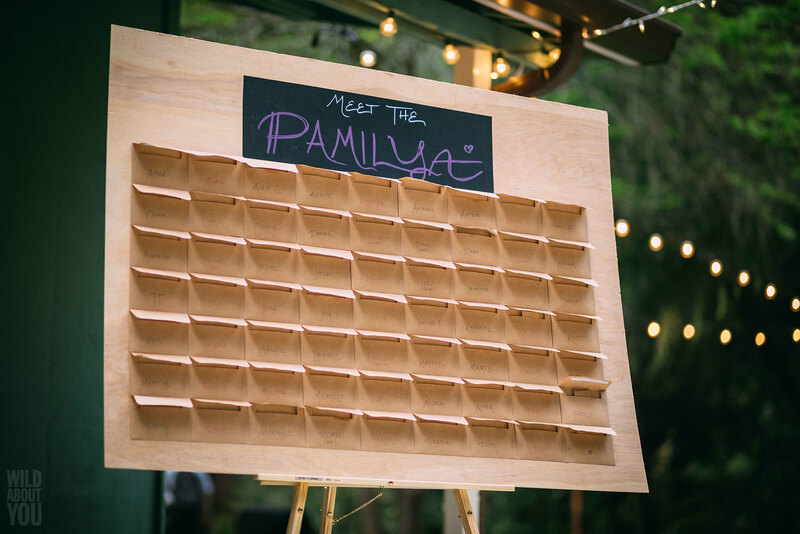 Our newlyweds and Justine’s family did a wonderful job creating the seating chart board, menus, table signage and centerpieces, and Polaroid station. 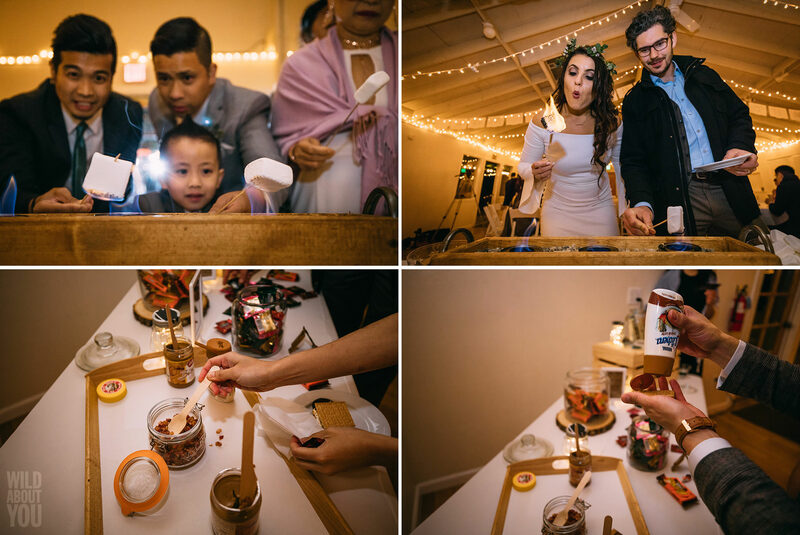 The DIY s’mores bar was also a hit and featured Justine and Josh’s favorite recipe “Dulce de Lechon”—bacon bits, dulce de leche, cinnamon graham crackers, and dark chocolate. 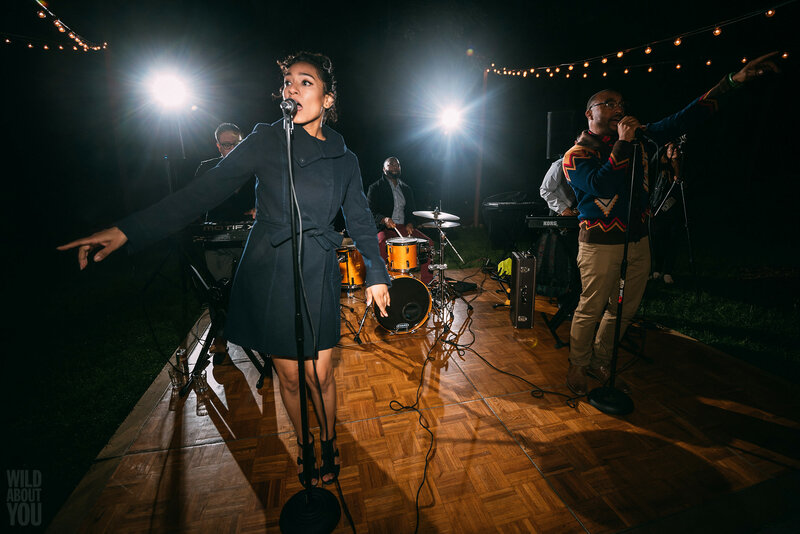 After dinner, the celebration continued with candlelit performances in the amphitheater, showcasing, among other surprises, a rousing reunion performance of Josh’s college boy band as well as Terisa’s “hella dope” spoken-word pieces (one dedicated to Justine, another to Josh). 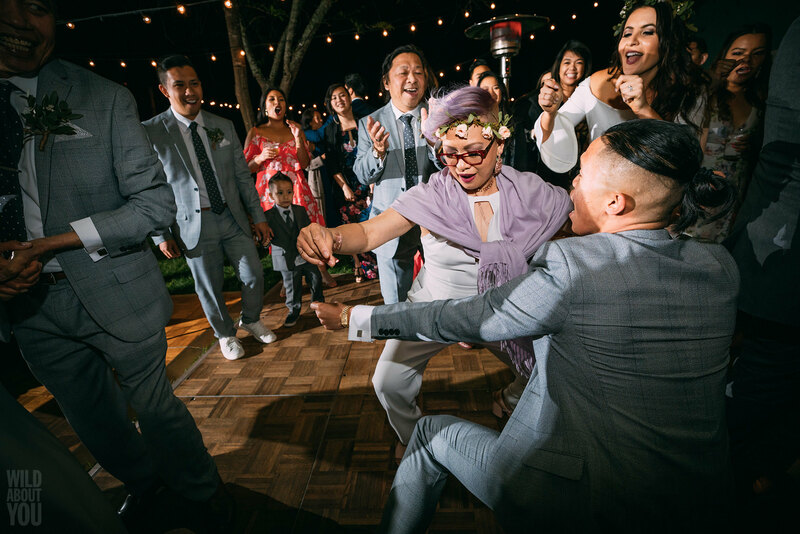 The ensuing dance party with live band No Water After Midnight was a riot, with danceoffs everywhere and the newlyweds’ friends spontaneously grabbing each of the parents and pulling them onto the dancefloor. 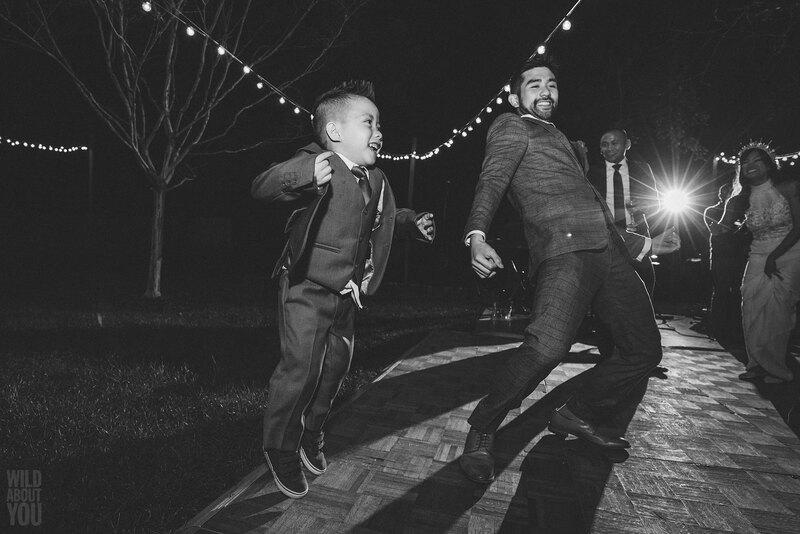 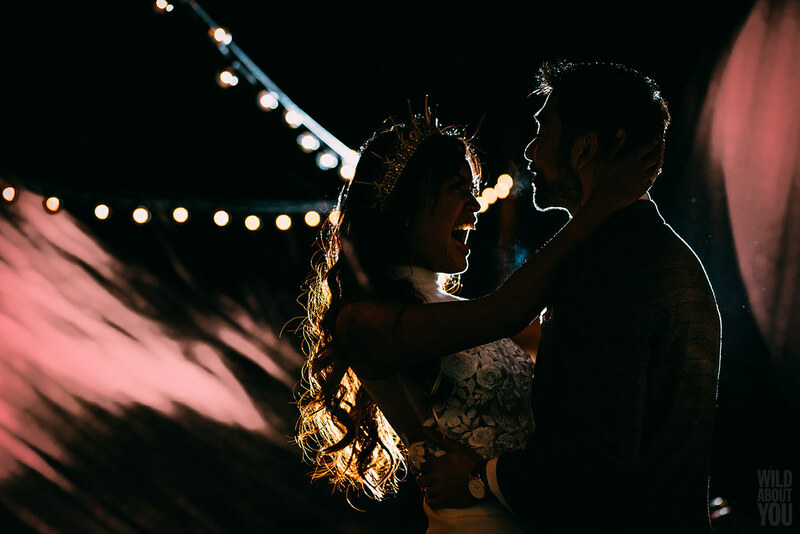 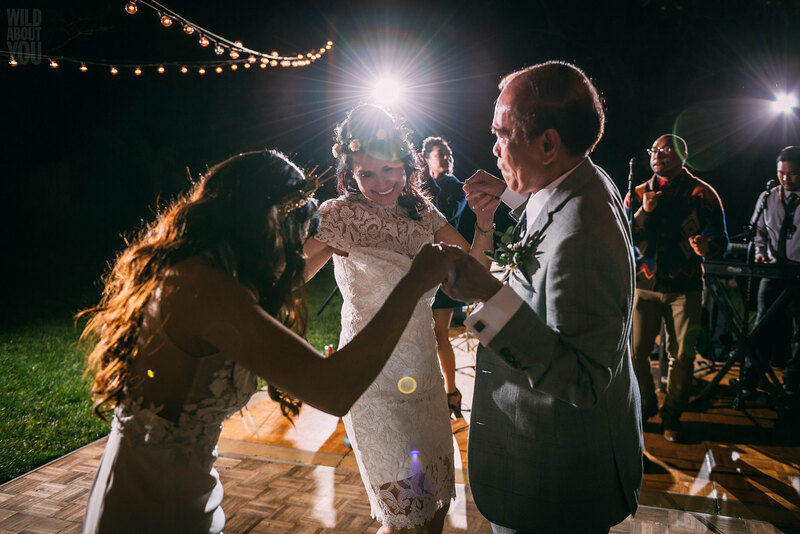 “This basically became the best alternative version of a father/daughter and mother/son dance we could’ve asked for!” says Justine. 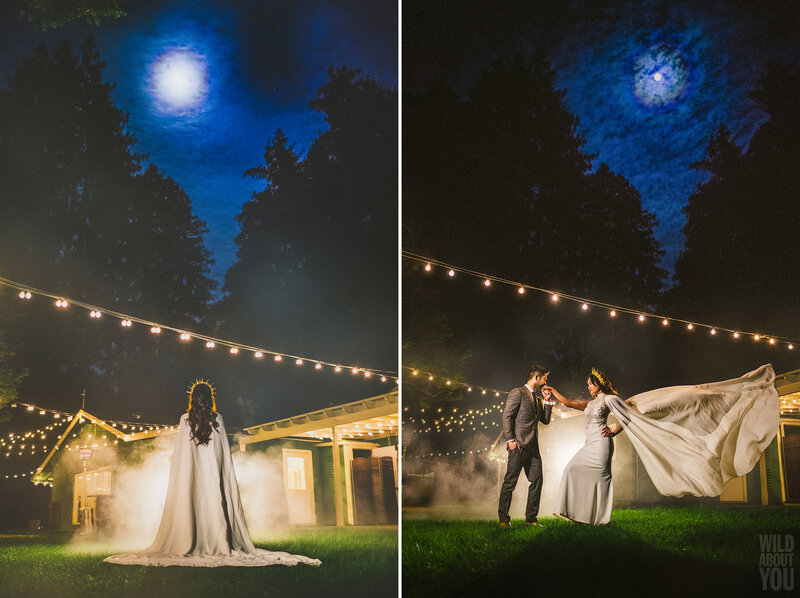 To top off this incredible day, a nearly full moon emerged from the treetops encircled by a glowing halo (technically a lunar aureole). 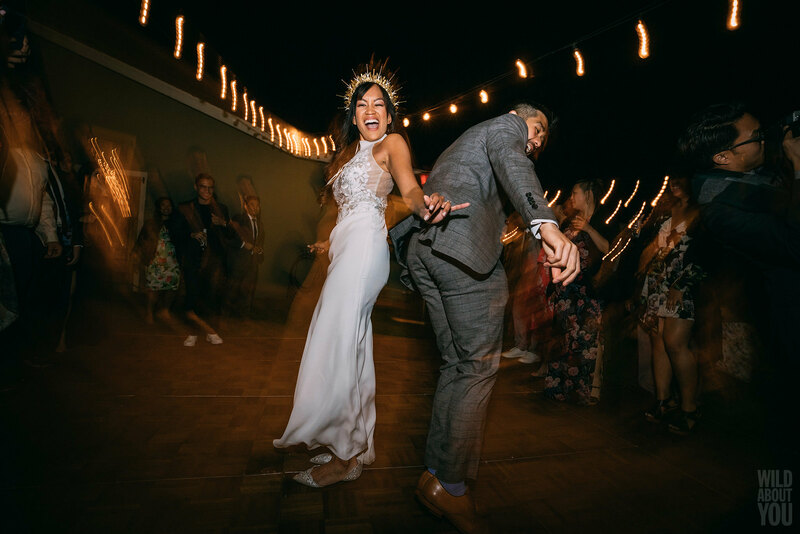 We were so lucky to capture Justine and Josh with the phenomenon! 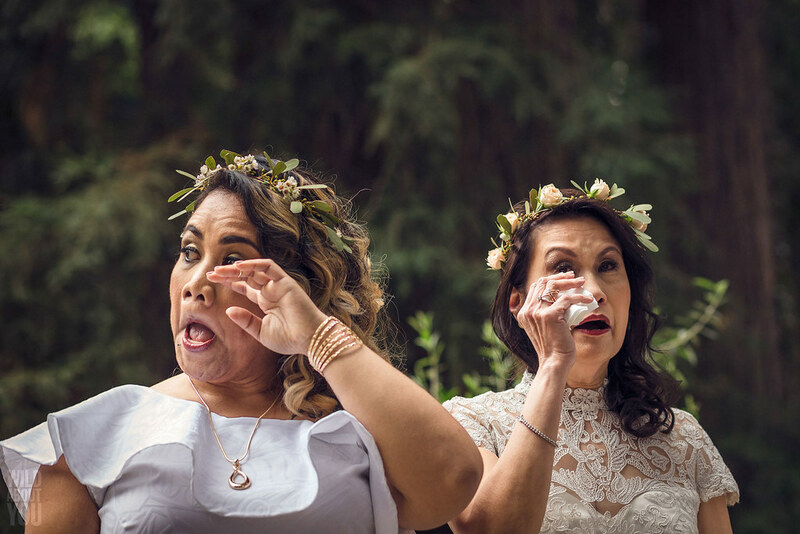 But that wasn’t all! 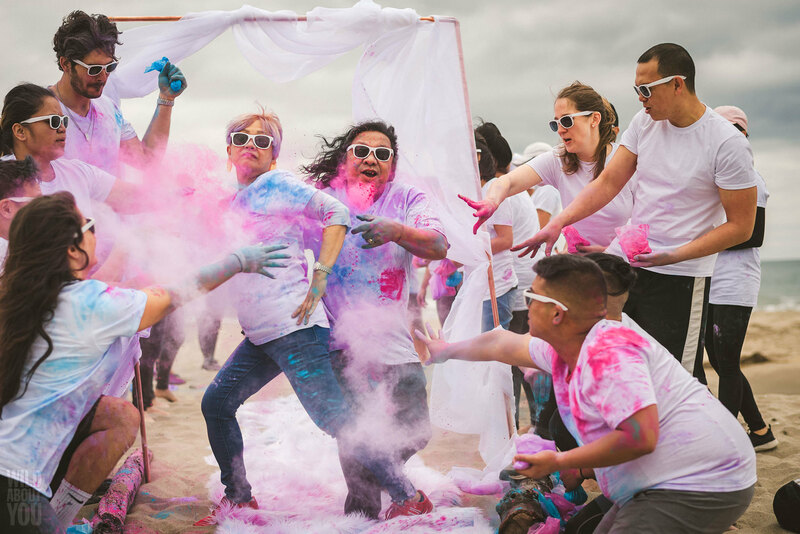 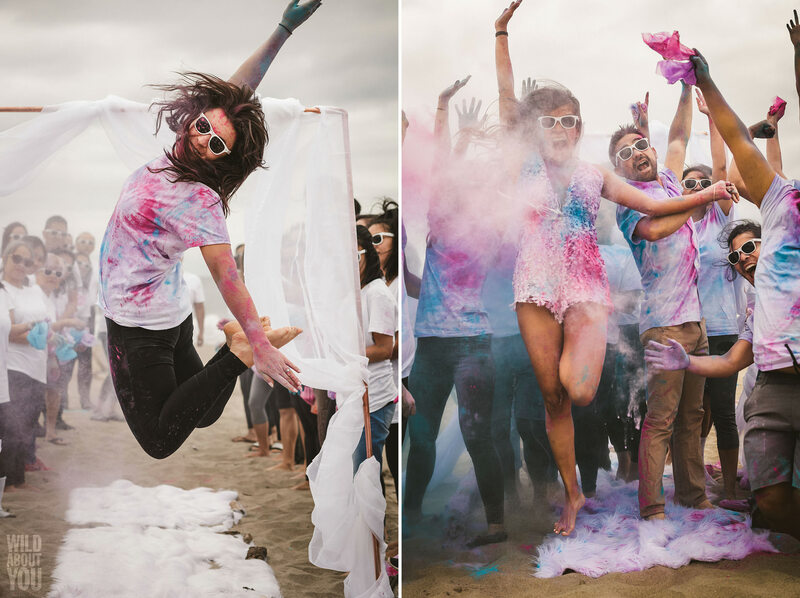 The next day, we headed to Rio del Mar State Beach in Aptos, where a farewell surprise greeted the guests: a sandy runway on which they could strut their stuff while being pelted with colored powder! 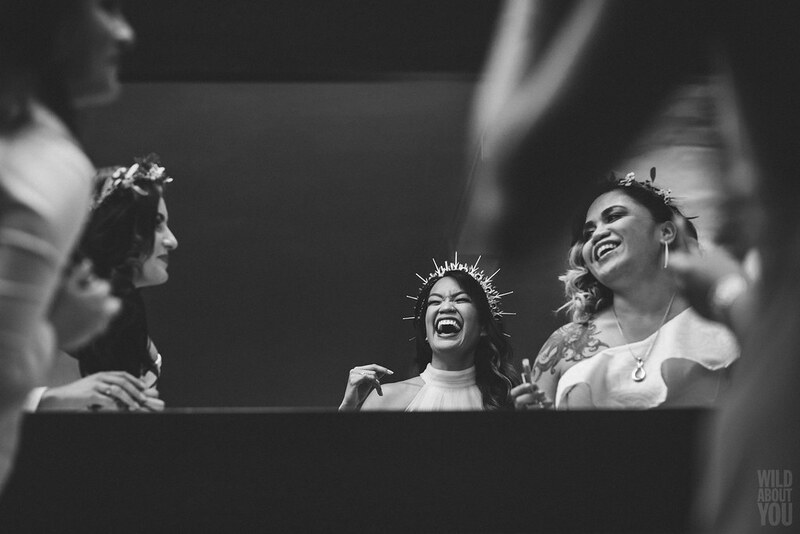 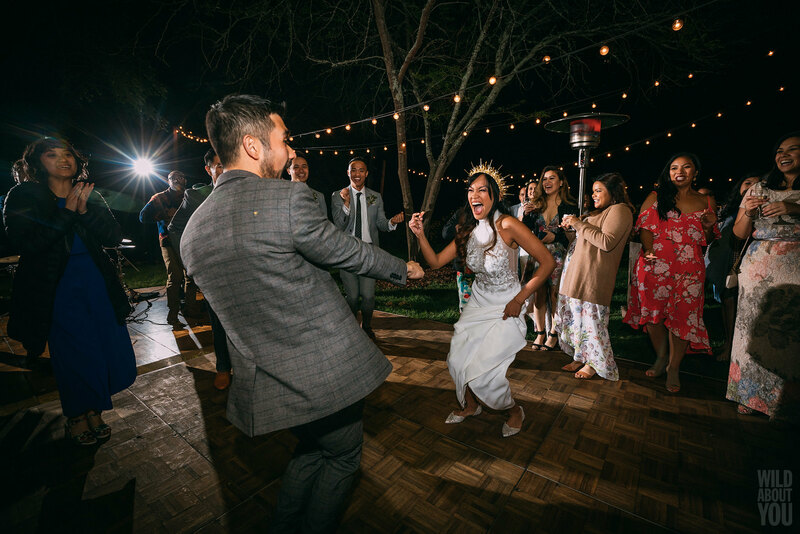 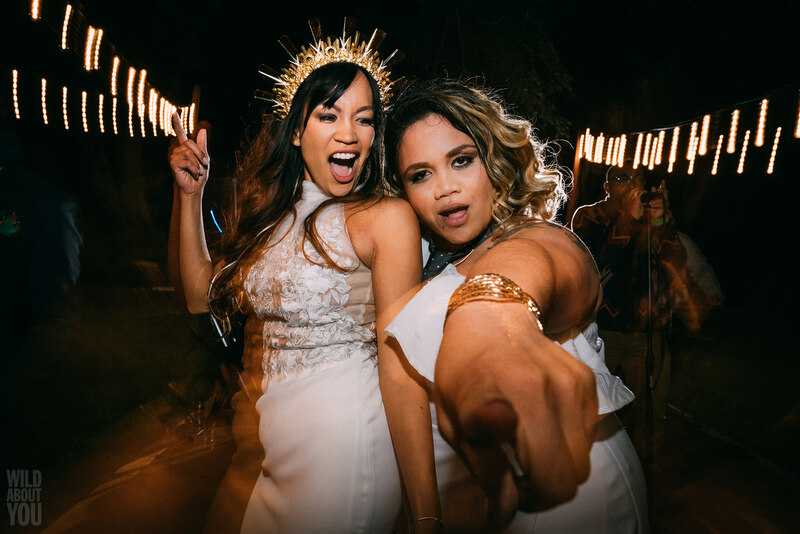 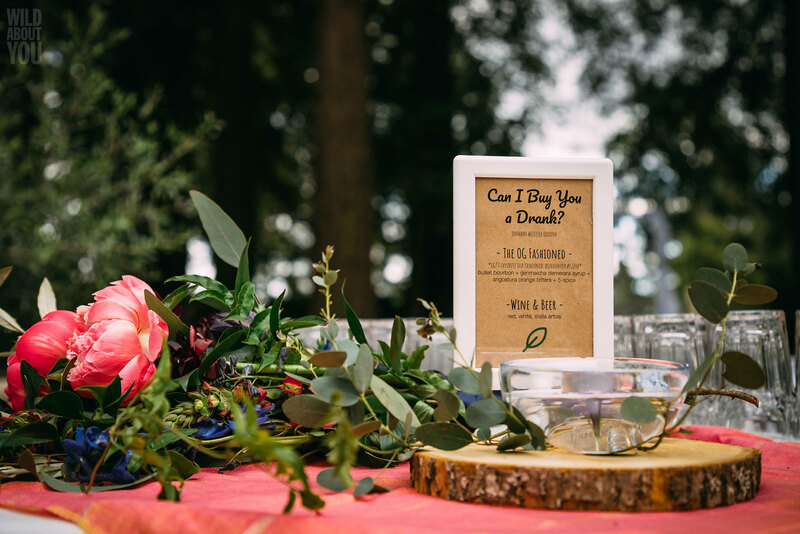 This vibrant, joyous event was the perfect ending to a vibrant, joyous wedding. 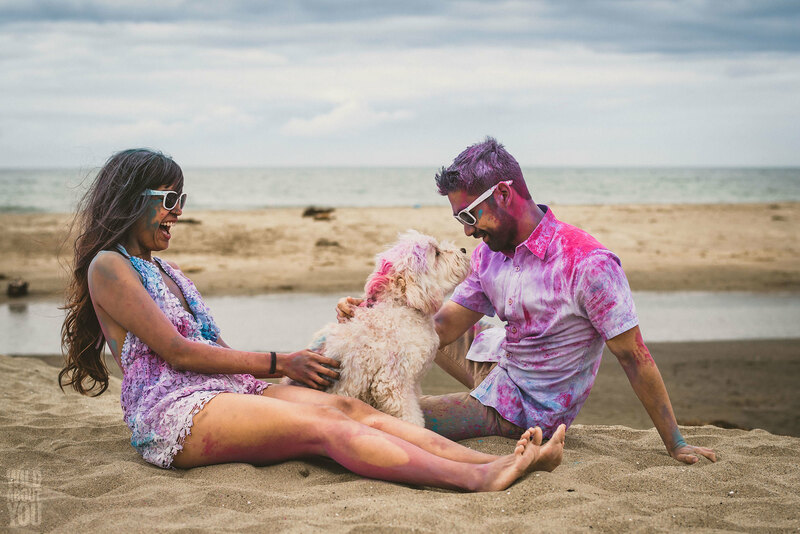 Here’s a look at their special weekend. 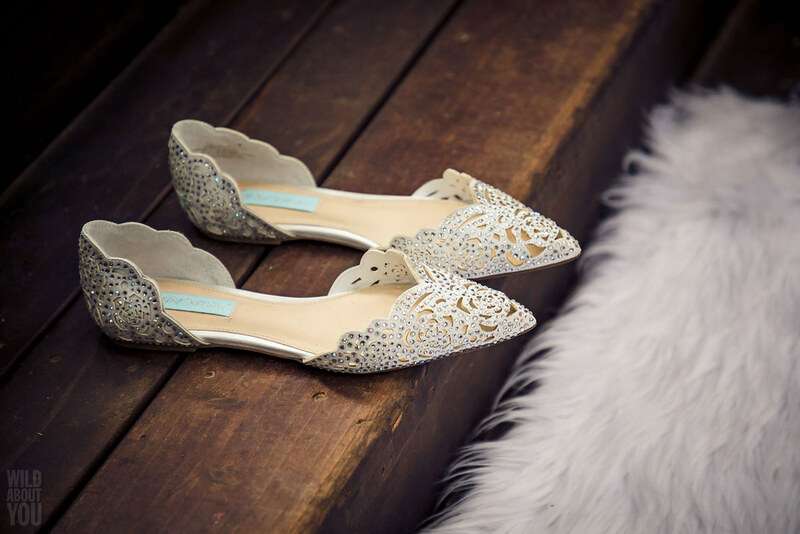 These are absolutely gorgeous! 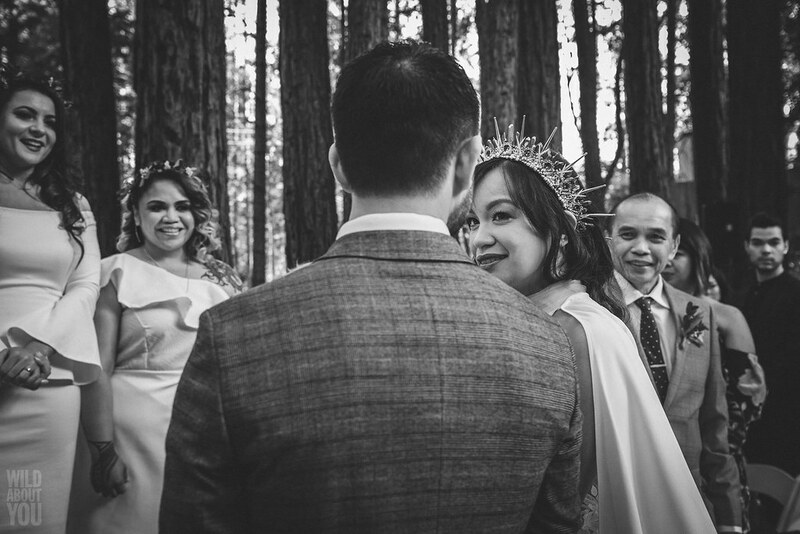 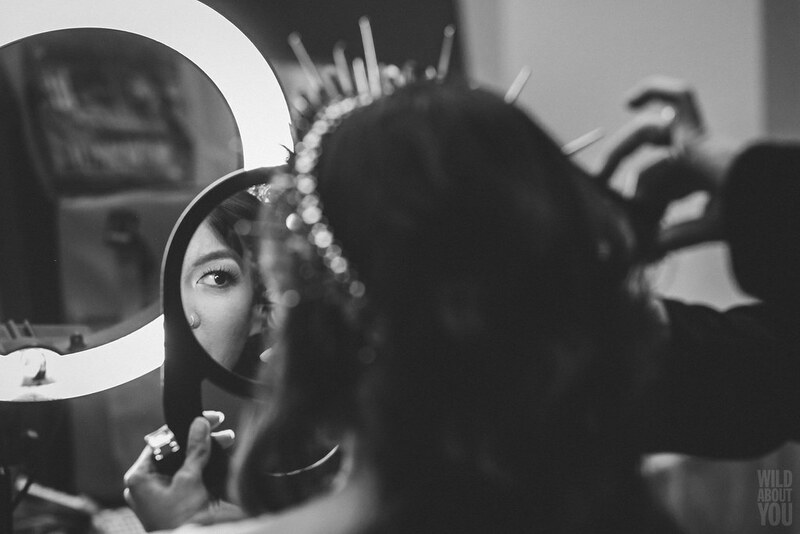 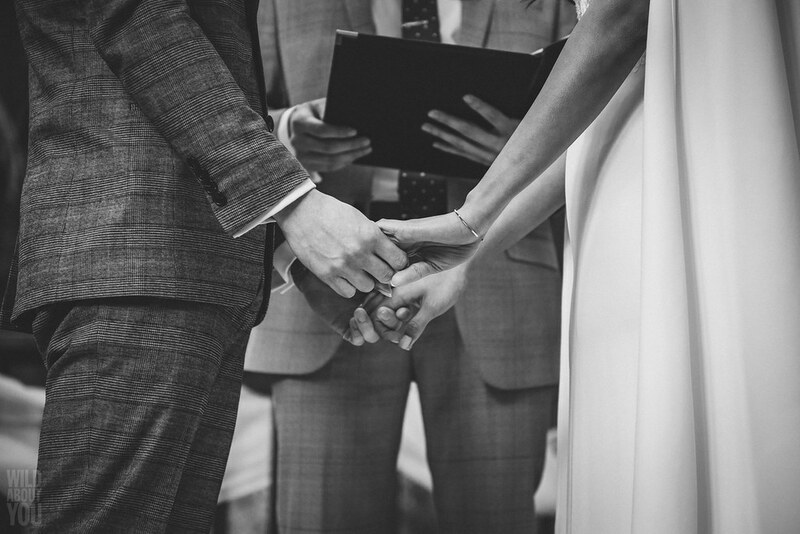 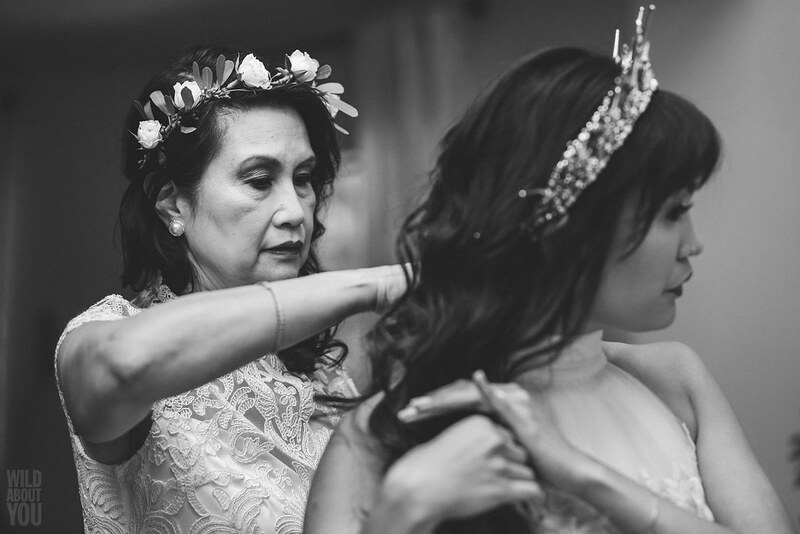 I love the mix of cinematic and intimate moments you captured!